My third day in Poland was undoubtedly the highlight of the trip for me. Visiting the town where my great-grandparents lived was the initial motivation for going to Central Europe in the first place. 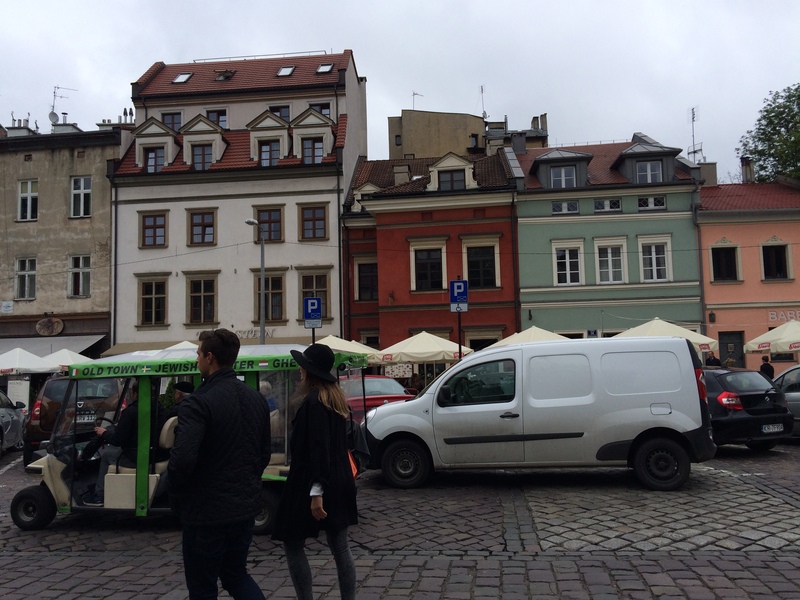 The stops in Prague, Budapest, and Vienna were the icing on the cake, but the cake was Poland and, more specifically, Tarnobrzeg. (I finally learned how to pronounce it, thanks to our guide Tomasz: TarNOBjeg.) I had high and emotional expectations; they were exceeded by the reality. First, some background. When I first started doing genealogy research, I had no idea where my maternal grandmother’s family had lived in Europe other than they were Galitzianers—from Galicia. My mother had no idea what town in Galicia had been their home, and for a long time the only location given on the records I could find was Austria, which made sense since Galicia was part of the Austria-Hungary Empire when the Brotmans lived there. 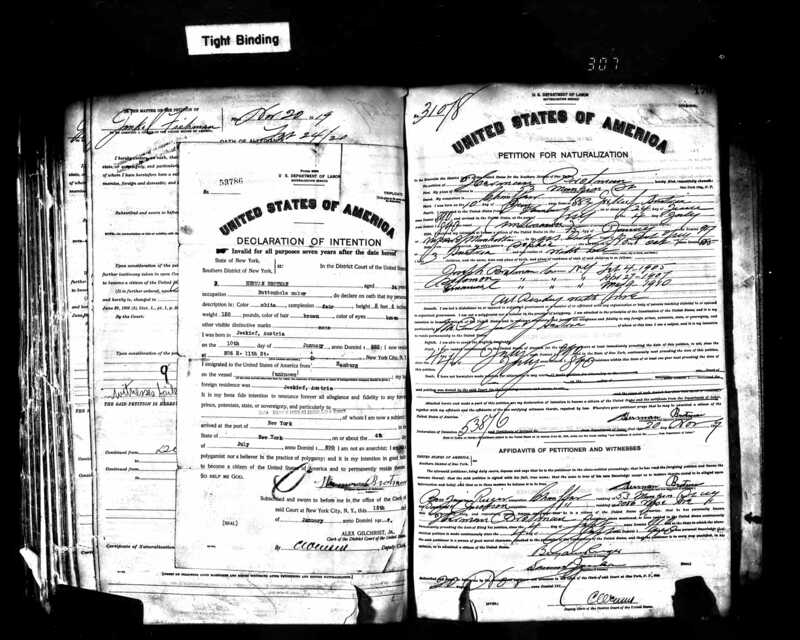 Then a few pieces came together—first, I obtained my great-uncle Hyman Brotman’s naturalization application giving his home town as Jeekief, which is a decent phonetic spelling of Dzikow, once a separate village but later incorporated into Tarnobrzeg, a much larger town. Then I found a ship manifest for Yossel Brod, most likely my great-grandfather, from Tarnobchiek, another phonetic spelling, this time of Tarnobrzeg. The ship manifests for my great-uncles Abraham and David Brotman gave their home town at Grebow, a small village less than ten miles from Tarnobrzeg. 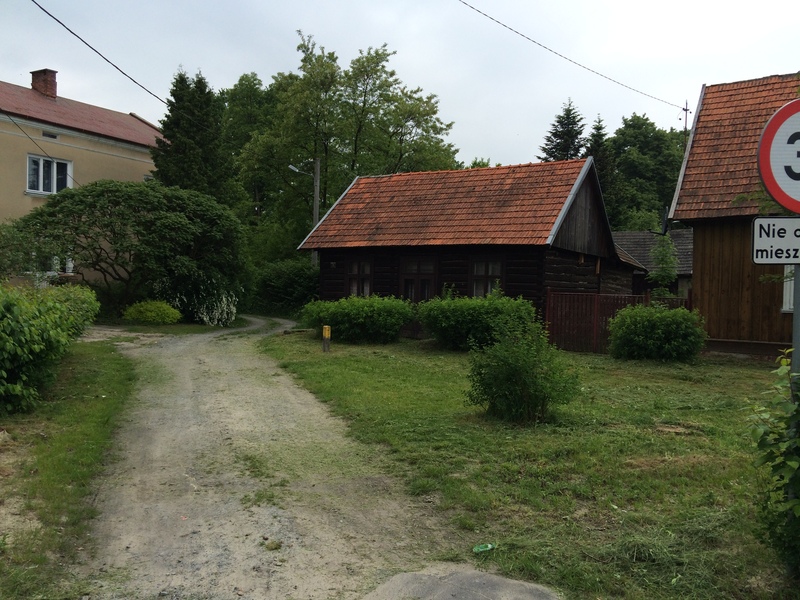 It seemed clear to me that Tarnobrzeg was the area where my Brotman ancestors had lived in Galicia. And I had to go there. I had originally hoped that there might be some records left in Tarnobrzeg that had not yet been digitized and put on line by JewishGen, Gesher Galicia, or JRI Poland, but our guide Tomasz warned me that he believed that whatever records still existed had in fact been found already and that we would not find any more in the town. I adjusted my expectations accordingly, and I decided to enjoy the trip for the experience of being there rather than as a research opportunity. Tomasz picked us up at our hotel at 9 am that morning, and we got to meet my recently found cousin Phyllis for the first time. Phyllis and I had connected through DNA testing, which showed us as third cousins and showed her aunt Frieda and my mother as second cousins. 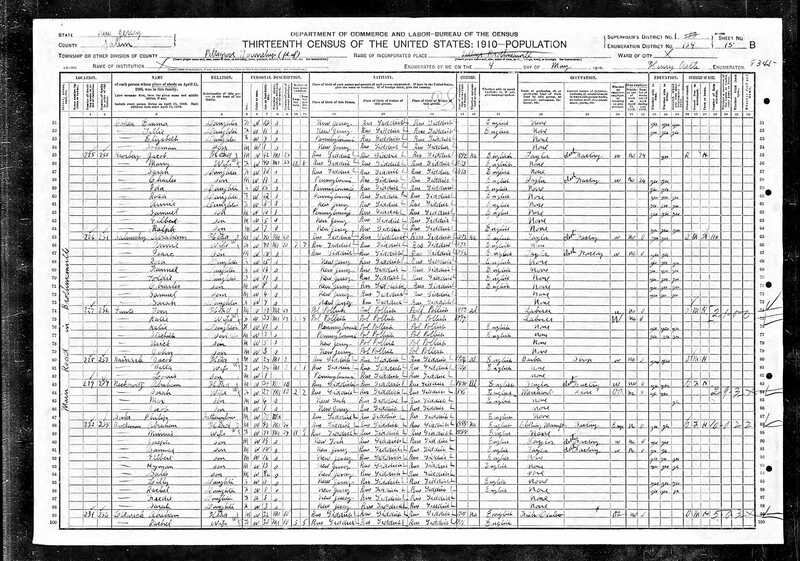 By comparing our family trees we had reached the conclusion that the likely connection was through my great-grandmother Bessie Brot Brotman and her grandmother Sabina Brot, whose father we believe was my great-grandmother’s brother. Sabina’s home town in Galicia was Radomysl nad Sanem, another town about ten miles from Tarnobrzeg, which we would also visit that day. 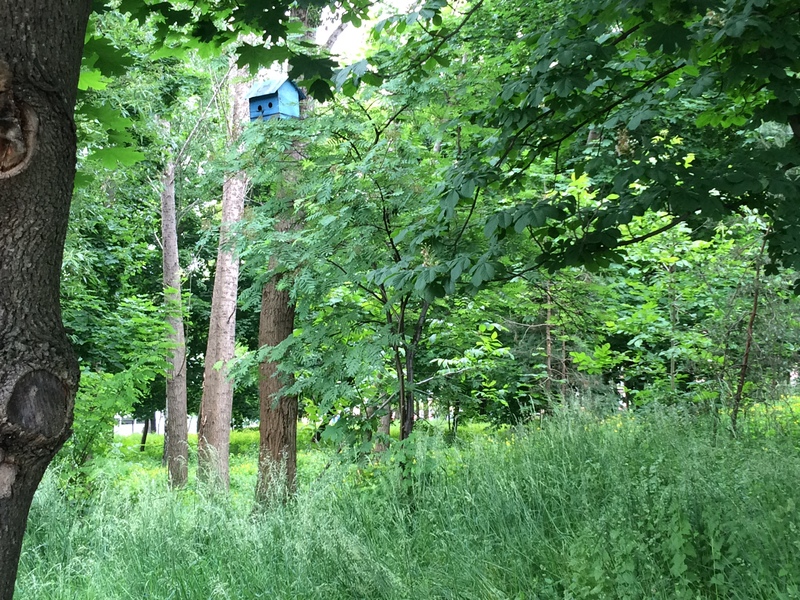 The common surname and the proximity of residences seemed to support our hypothesis. We quickly connected in person, chatting excitedly about our research, our travels, and our hopes for that day. 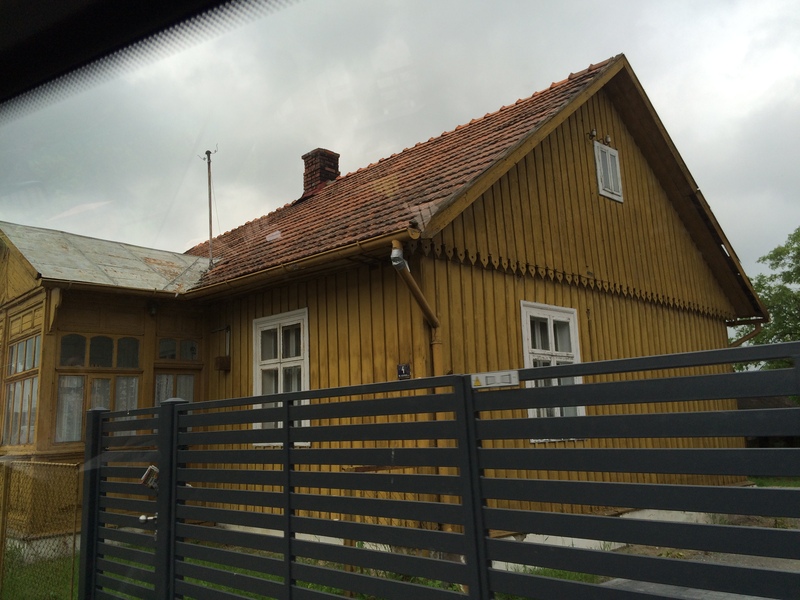 As we drove from Krakow to Tarnobrzeg, Tomasz spoke about the history of Jews in Poland. By the 19th century Jews made up 10% of the population of Poland, and they lived all over the country—in the cities and in small towns and in villages. The land we drove through was mostly rural even today, and Tomasz said that Jews were often invited by the kings or the aristocracy to live in the towns to support the local economy; Jews had the education and the skills to provide bookkeeping, trade, banking, and other economic necessities to the farmers who lived in these regions. 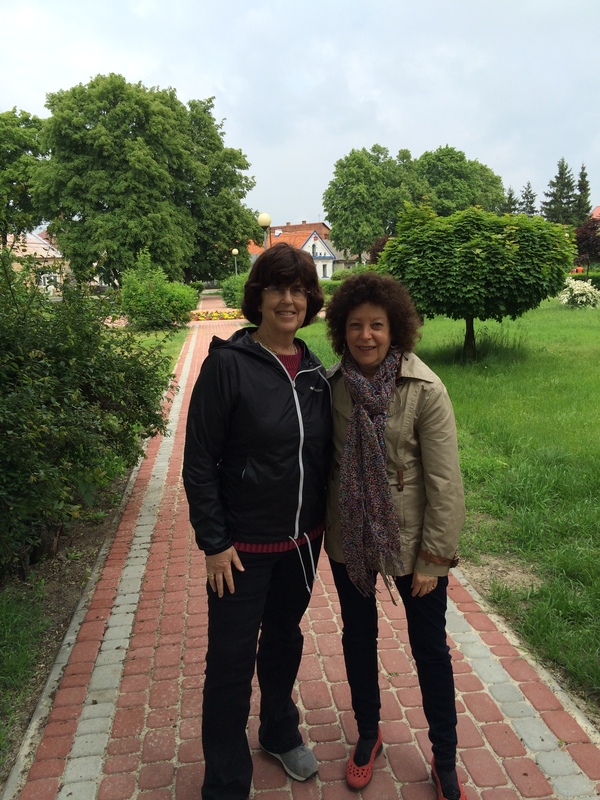 In Tarnobrzeg it was the Tarnowski family that owned the land and invited the Jews to come live there. When I asked him about the level of religious observance of the Jewish residents who lived in places like Tarnobrzeg, Tomasz said that there was a diverse range of religious observance—-from Hasidim to more traditional Orthodox to more liberal Jews and to secular Jews. 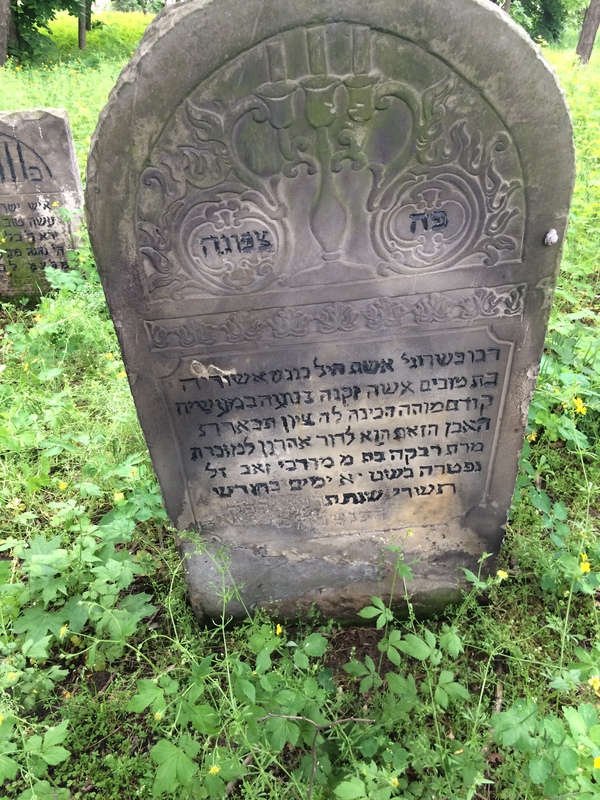 Other sources point out that Tarnobrzeg was an important Hasidic center with well-regarded Hasidic leaders and rabbis. Tomasz also spoke about the fact that Tarnobrzeg was one of the leading Jewish population and industrial centers in Galicia outside of Krakow. The main industry aside from agriculture was the production of sulfur, a product that it still important to the local economy of the region. Tarnobrzeg is located where two rivers meet—the Vistula (which also runs through Krakow) and the San, and thus was an important trade location. It also is very close to what was once the border with the Russian Empire, and when Russia obtained that land, families were often separated, some living in Austria-Hungary, some in the Russian Empire. 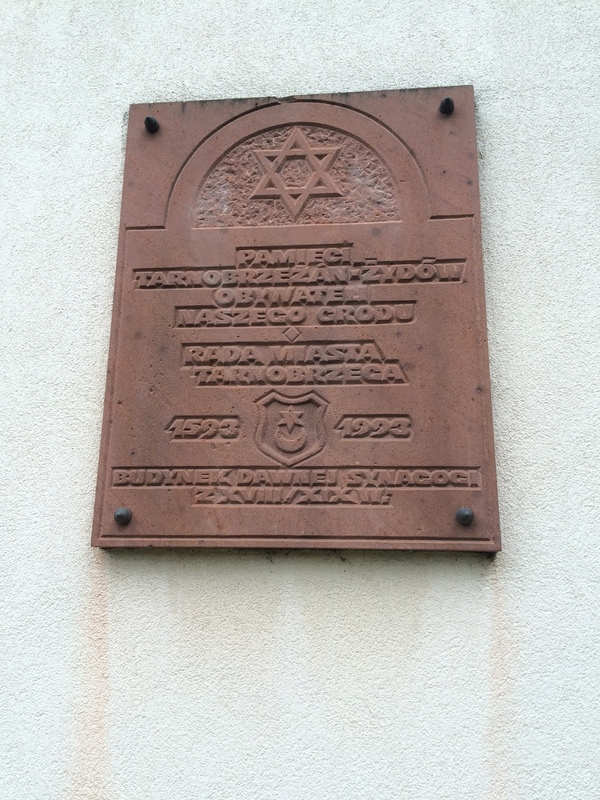 In the 19th century when my great-grandparents lived there, the population of Tarnobrzeg was more than 75% Jewish. 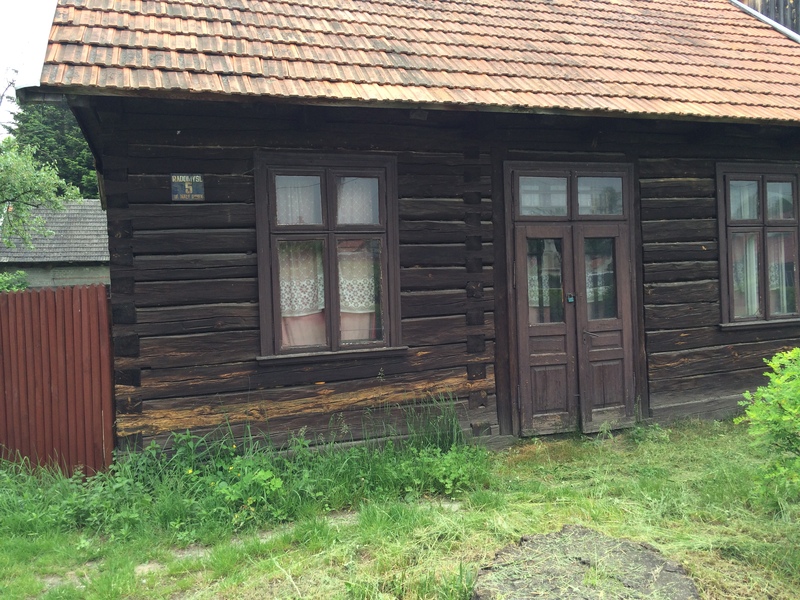 There were about 2800 Jews living there in the 1880s when my great-grandparents decided to leave. 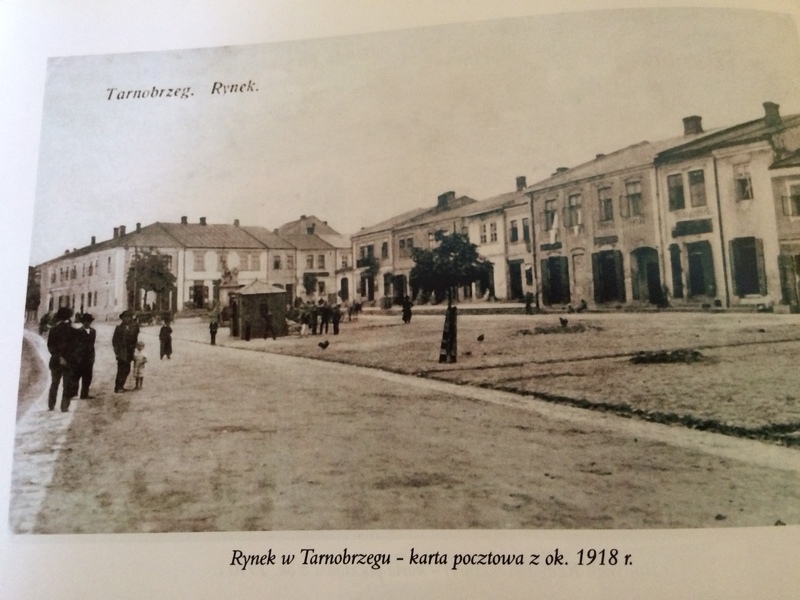 I asked Tomasz why people like my great-grandparents would ever have left a place like Tarnobrzeg, where Jews were doing well and treated well and were more than a majority of the town’s residents. He said that in the late 19th century, there was both an economic crisis in Poland and a significant increase in the population. (There was also a great deal of anti-Semitism in Poland, as other sources describe.) Jews and non-Jews left for greater economic opportunities. When I pondered how a family would be able to tear themselves away from their home, both emotionally and financially, Tomasz explained that there were emigration agents facilitating these departures. They would circulate brochures touting the advantages of going to America, and the fact that many others were leaving made it easier for a family like mine to make a similar choice. I asked how they would actually leave, and Tomasz said there was a train that came to Tarnobrzeg that would take them to one of the port cities, like Gdansk or Hamburg, where they would catch a ship for America. It would be costly, but the potential benefits made it all seem worth the risk. 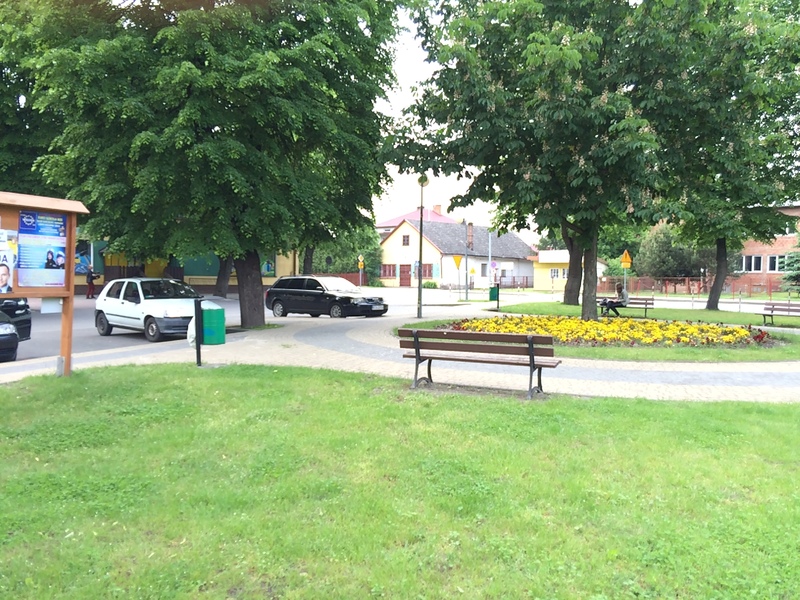 Finally we arrived in Tarnobrzeg itself. 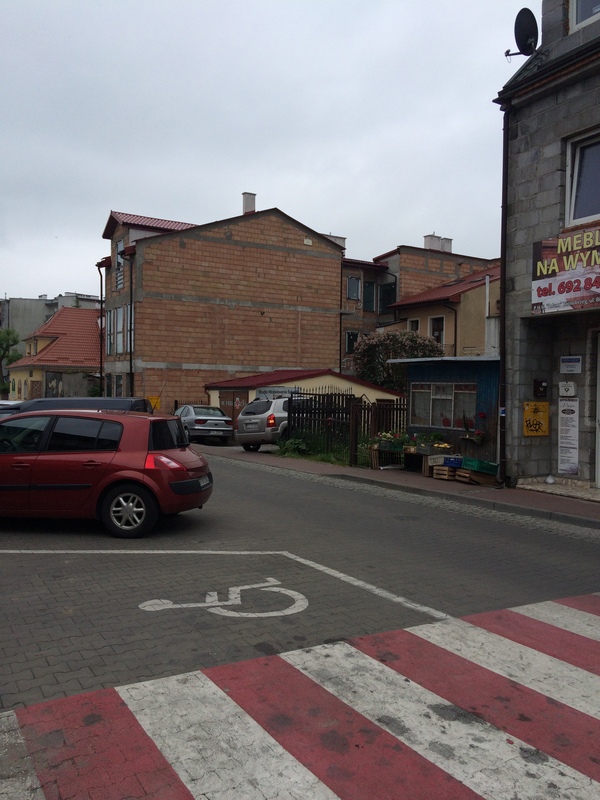 It was not exactly what I expected, as it is a large town, not a little shtetl, and it is a thriving town—lots of people, lots of stores, lots of cars. Not a quiet little romantic village out of Fiddler on the Roof at all. There was even a Lego store right on the main square. But once we got out of the car and started to walk around, I felt some almost eerie connection—that this was a place where my great-grandparents had walked, had shopped, had worked. Many of the buildings that surround the square were there back in the 1870s and 1880s when my great-grandparents and their children lived there. Maybe one of those buildings contained a shop where my great-grandfather worked (on that ship manifest his occupation was given as “kaufmann” or merchant). Maybe my family lived in one of them. I stood in that square, imagining it 150 years ago as a place filled with families like my own, Jewish families of all sorts, living in a safe and comfortable way in a safe and comfortable place. I could imagine my great-uncle Chaim who became Hyman and then Herman and my great-aunt Tema who became Tillie, just small children, holding their mother’s hands as they walked through that square. I could block out the Lego store and the ugly modern supermarket and see just the old buildings as they might have looked in the 1880s. 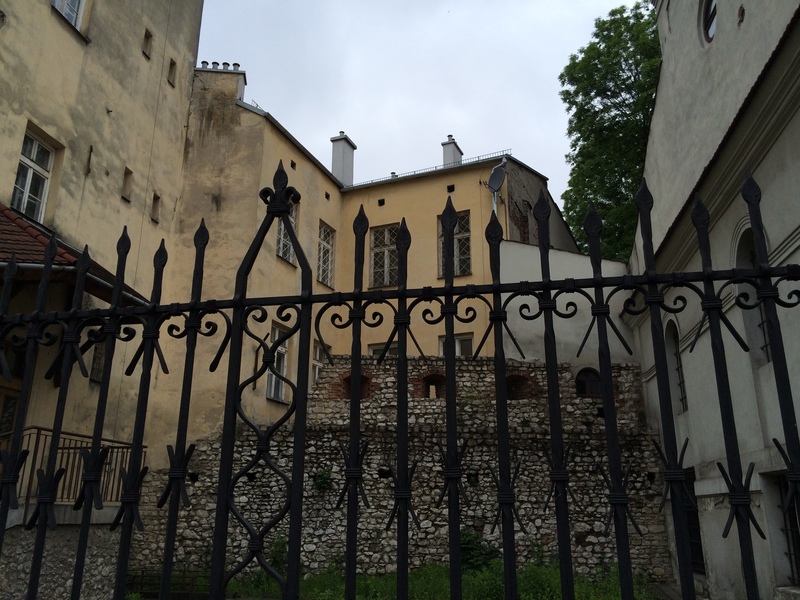 Tomasz took us to the building which was once the synagogue. According to the official Tarnobrzeg website, it was heavily damaged by the Nazis and used to store grain. It was renovated in the 1970s into a public library, and there is almost no sign today that it was ever a synagogue building. The windows were changed, and inside where there was once a prayer hall and aron kodesh are now stacks filled with books. When we asked in the library whether they had any photographs or books or records about the synagogue or the former Jewish community, all they could find was one copy of a brochure that had only been created a few years ago. 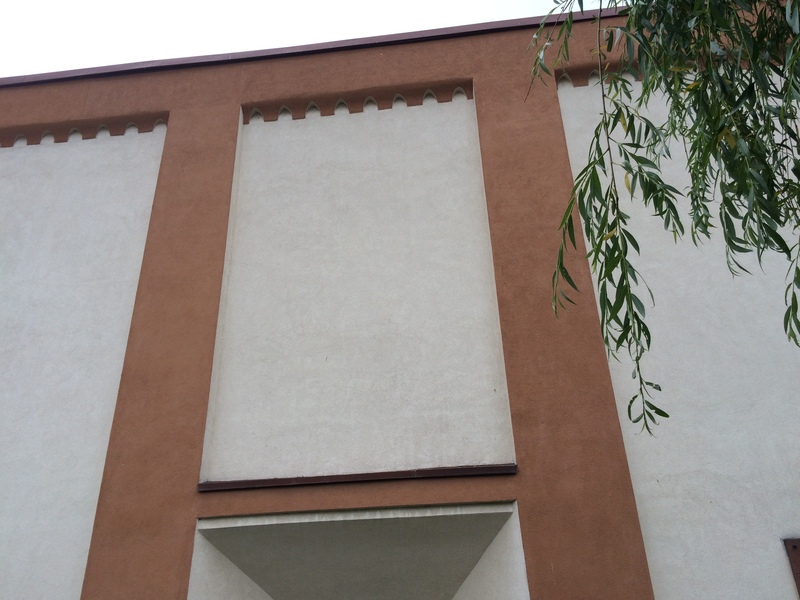 The only visible sign that the building was built as a synagogue is a small plaque on the exterior of the building in a location that almost no one could ever see or read if they were not looking for it. We had to walk around the building through the lawn to get this photograph. The only small comfort was that the building was being used for books and education, not for commerce or worse. 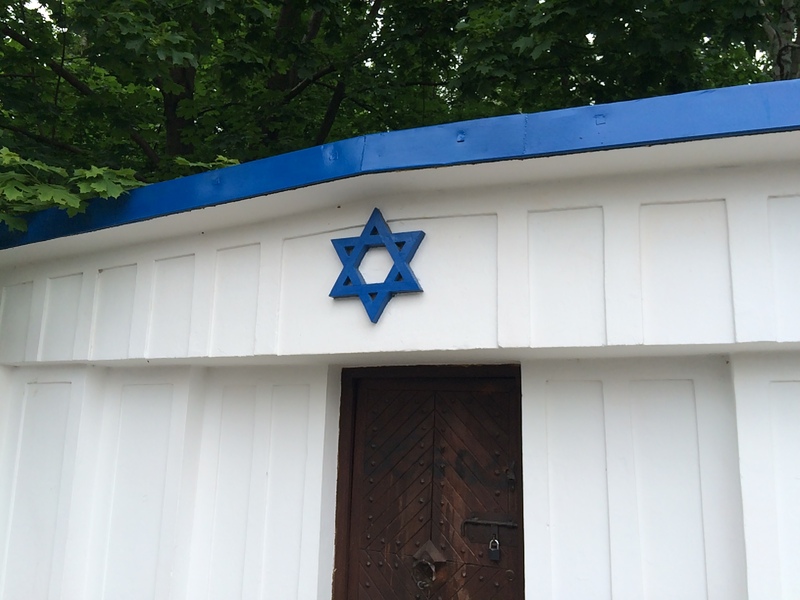 We then drove to the other Jewish cemetery in Tarnobrzeg, which was opened in the 20th century and where there is still an ohel with a Star of David. Sadly, the cemetery is not maintained at all, and there are just a handful of headstones still standing, most covered with weeds and snails. I took photographs of as many as I could and now hope to get these translated. After visiting the cemetery, we went to a small museum Tomasz knew about, where we met with an incredibly helpful woman who did not speak any English, but when Tomasz explained why I was there, she was very excited and anxious to help. 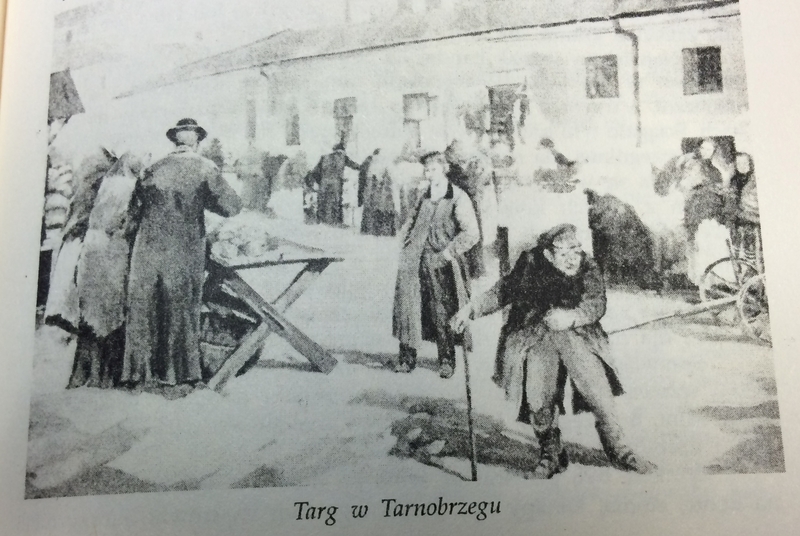 She provided us with some books with drawings and photographs of Tarnobrzeg before World War II. 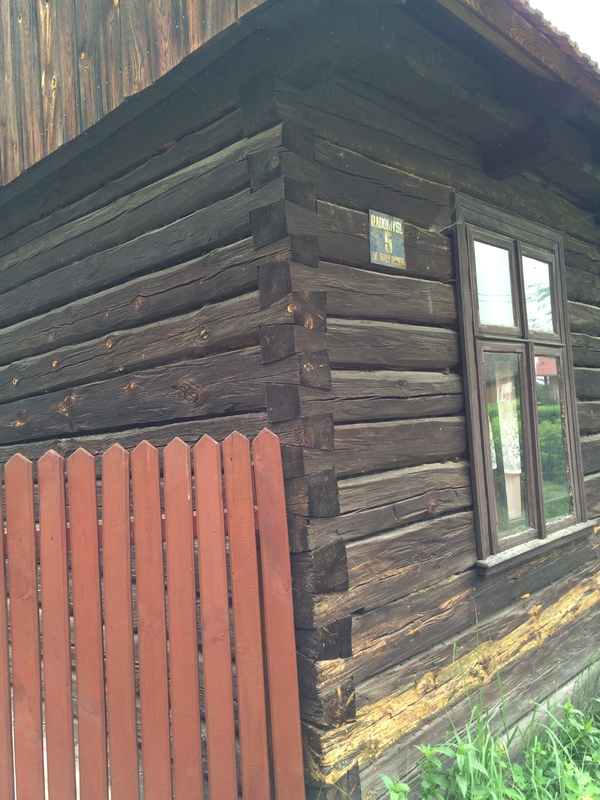 The woman at the museum also explained where Dzikow had been located before it merged into Tarnobrzeg, so we drove there and saw some very old homes, built almost like log cabins. I was enchanted and wondered whether one of these buildings had once been my great-grandparents’ home. 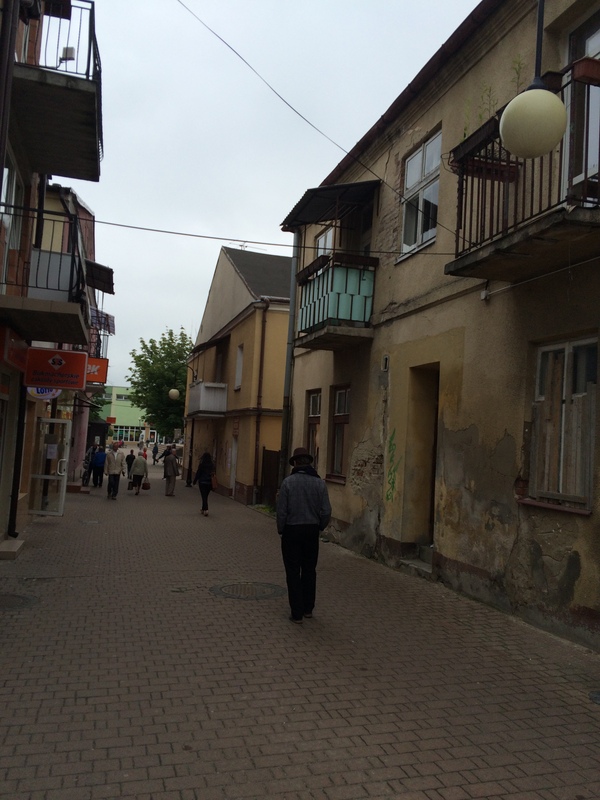 As we left Tarnobrzeg, Tomasz told us what had happened to the Jews there during the Holocaust. Many were shot and killed just outside of town and buried there. Many others were taken to the San River and shot, their bodies falling into the water. The rest were eventually transported to a concentration camp or a death camp. 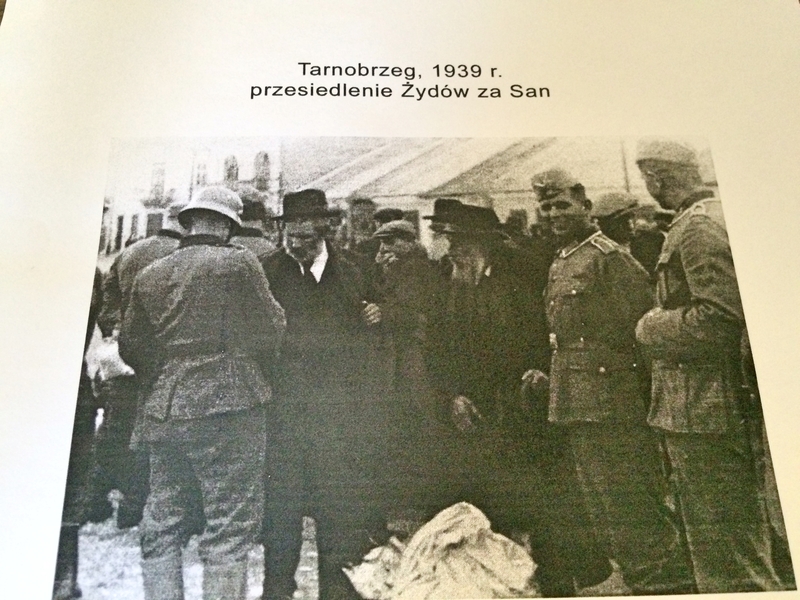 If any survived, they have not returned to Tarnobrzeg. There are no known Jews living there today. 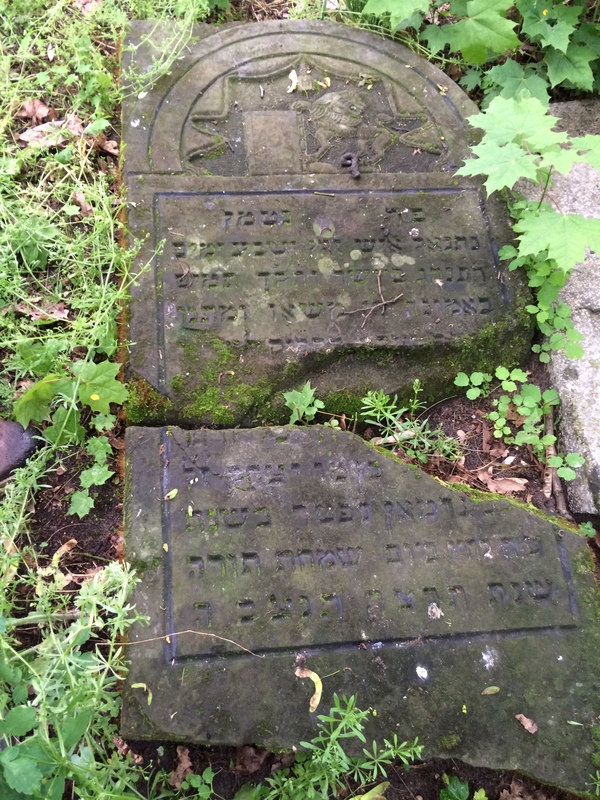 What would my great-grandparents, both of whom died before the Holocaust, have thought if they returned to their hometown today? It would no longer be the place they knew in almost any way, except for the old buildings that survive. 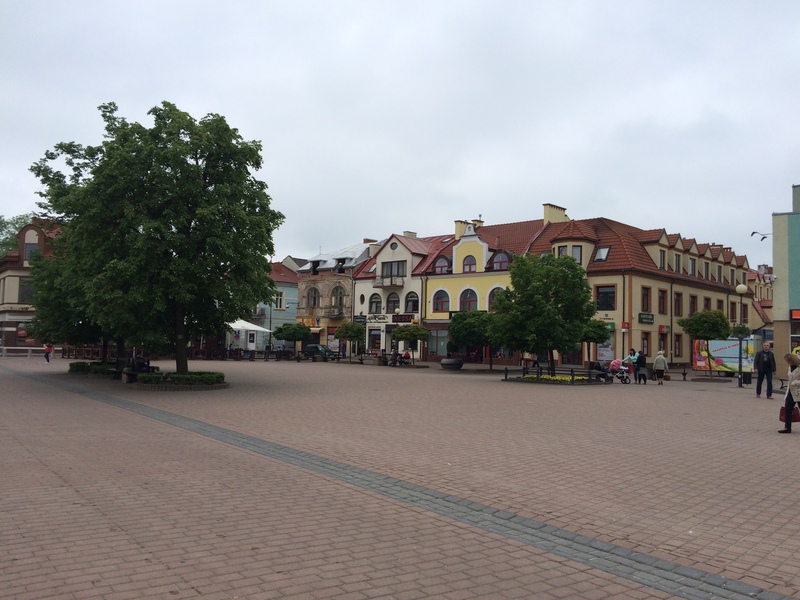 I could have stayed and wandered around Tarnobrzeg for hours, but we had two more stops to make: Radomysl nad Sanem and Grebow. 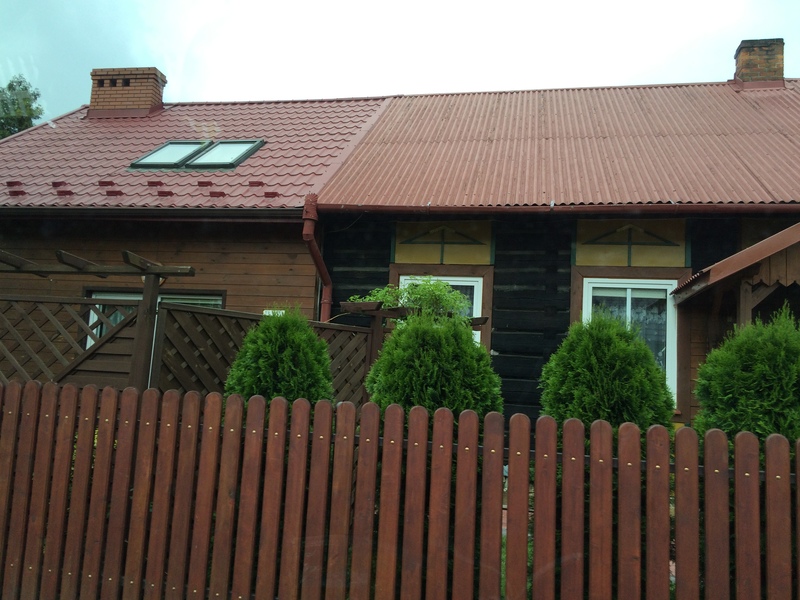 We headed first to Radomysl nad Sanem, where Phyllis’ grandmother had lived. It is on the other side of the San River and is a very small little town with a small town square and municipal building and perhaps fifty homes, if that many. Its Jewish population before World War II was less than 400 people, and the village was mostly Jewish. We drove from one end of the town to the other, and it took only a few minutes. 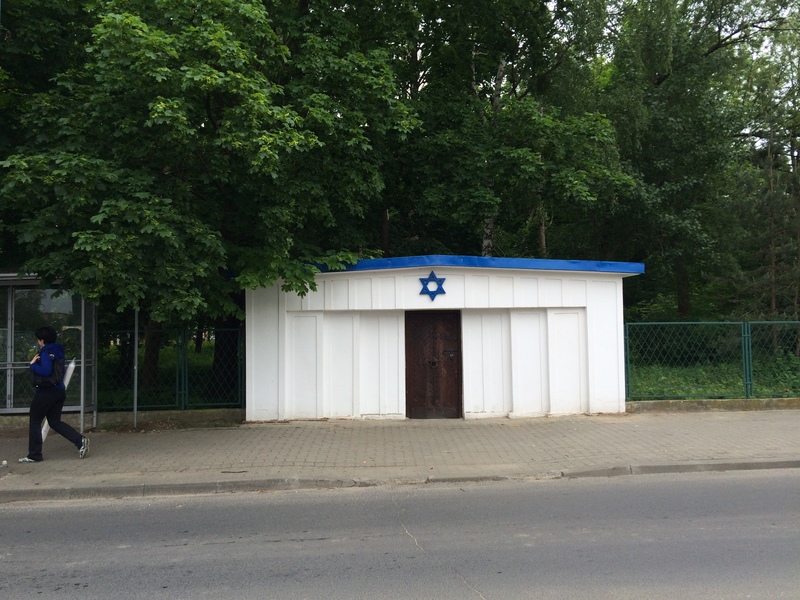 Even more so than in Tarnobrzeg, there is no sign that there were ever Jews there. Phyllis was able to obtain some brochures about the town from the library there, but nothing that discussed the former Jewish community. 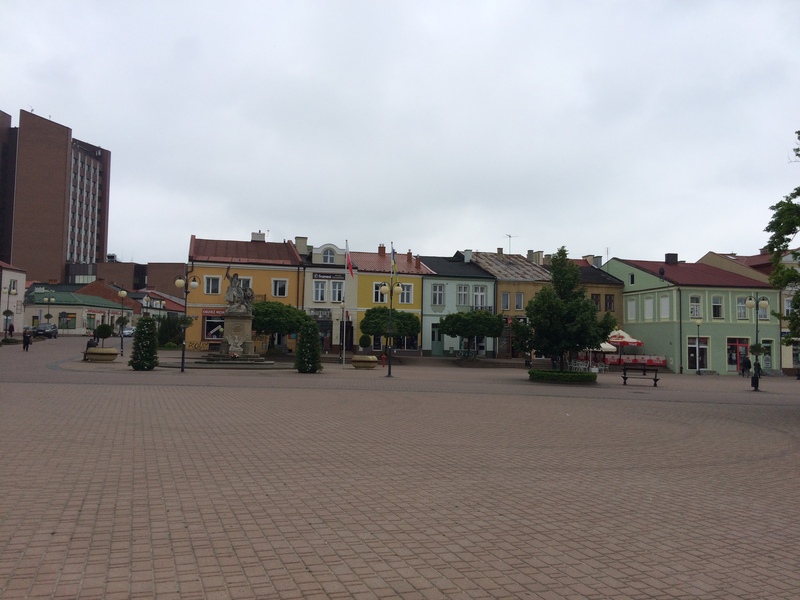 Our last stop was a quick one in Grebow, a town even smaller than Radomysl nad Sanem where there was not even a library we could visit. I don’t know whether this was where Abraham and David Brotman were born or simply where they were living at the time they emigrated. 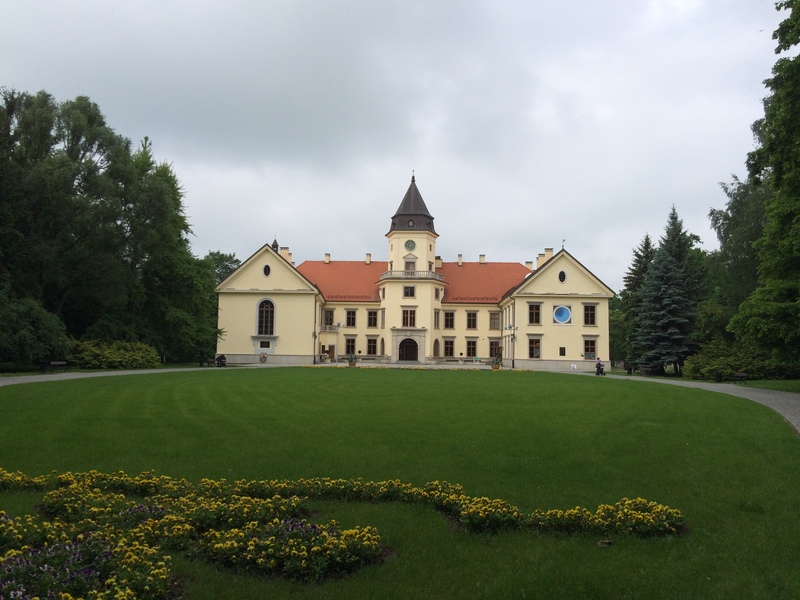 Perhaps they had moved here for greater opportunities than they could find in Tarnobrzeg. I don’t know. It’s such a tiny village that all I can do is imagine them living there and then wonder what they must have thought when they landed in a place as large and crowded and dirty as late 19th century New York City’s Lower East Side. 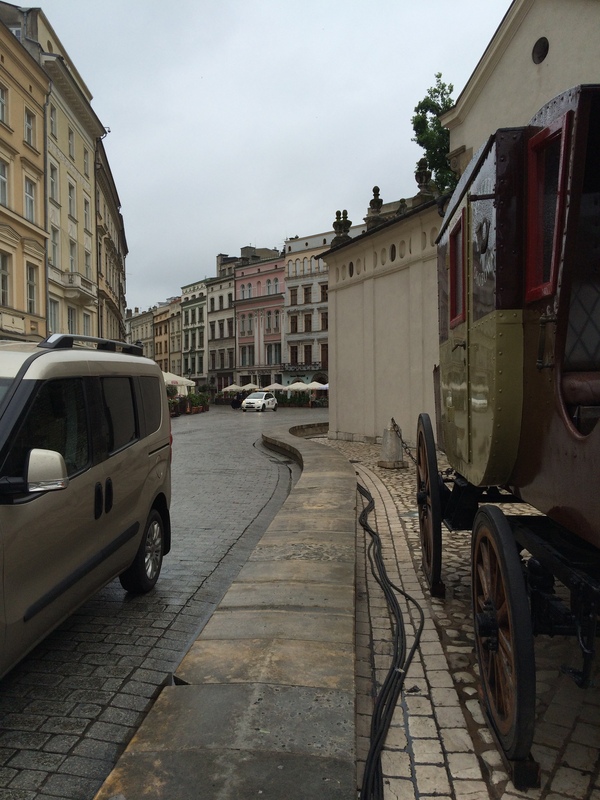 We then headed back to Krakow. I was exhausted and emotionally drained and filled with thoughts and feelings. 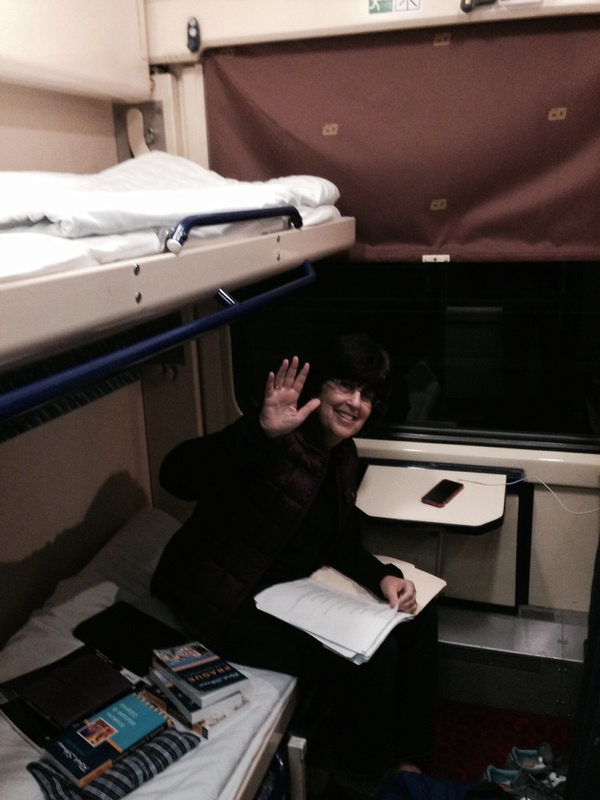 We were taking another night train that night, this time to Budapest. As we ate a quick dinner at our hotel, I found myself overwhelmed with emotion in a way that surprised me. My eyes filled with tears—tears for the people who had been killed, tears for my great-grandparents who had left this country for better things, tears of gratitude that they had done that, and tears of sadness that I was leaving a place that part of me truly felt was my homeland. 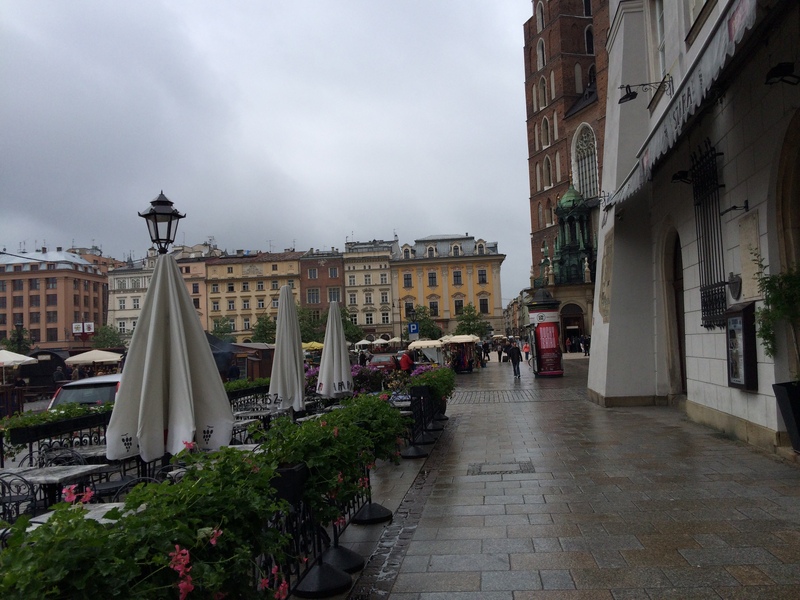 We arrived in Krakow after a pretty much sleepless night on the train, and the weather was nasty—very cool and raining hard. Once again, we overpaid a cabdriver (though not by nearly as much) to get to our hotel at 7 am, where our room was, as expected, not ready. (Check-in wasn’t until 3 pm.) But the young man at the reception desk was so friendly and helpful that it immediately changed my outlook. 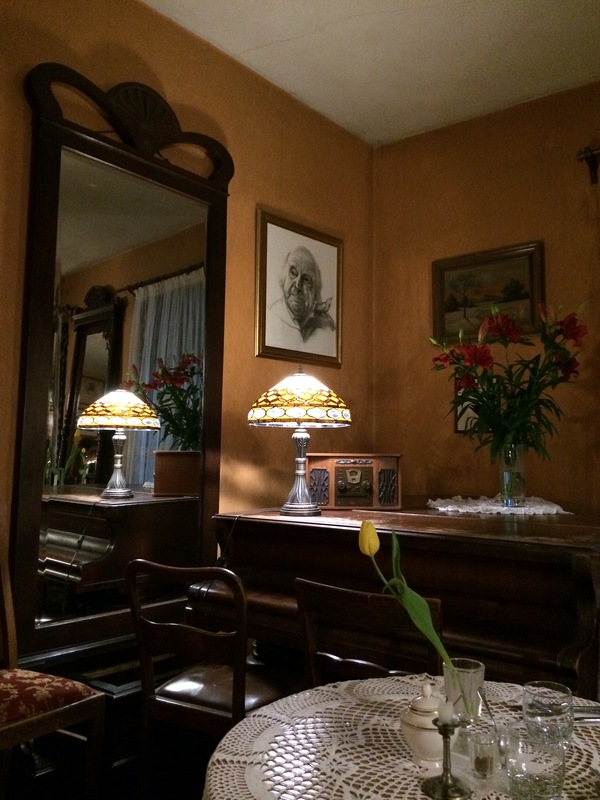 I highly recommend the Metropolitan Boutique Hotel in Krakow—a small and friendly hotel with an incredibly professional, efficient, and friendly staff. 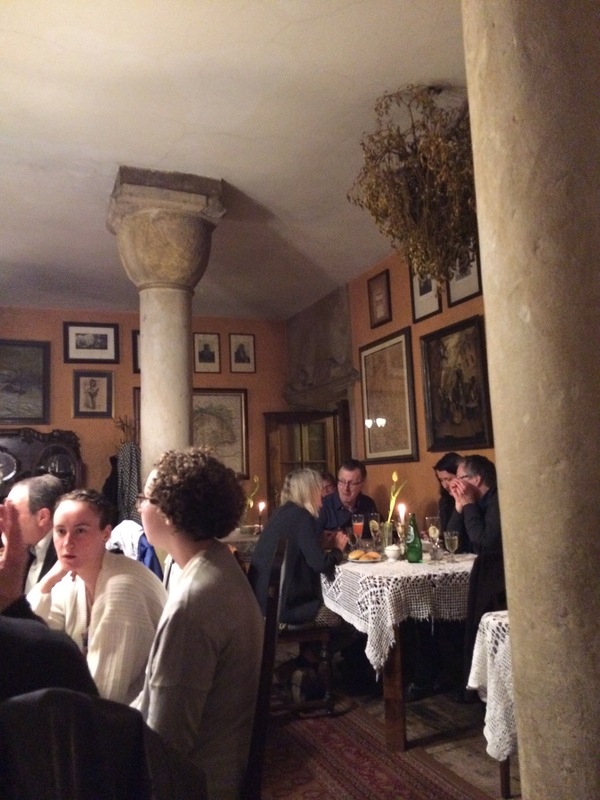 Although the location on a small side street at first seemed odd, we soon realized how ideal that location was—about ten minutes from the main square in Krakow and even closer to the Jewish Quarter in Kazimierz. After breakfast at the hotel, we decided to venture out and see the city. We took umbrellas, but fortunately we never had to open them; the skies never turned blue, but the rain was gone. 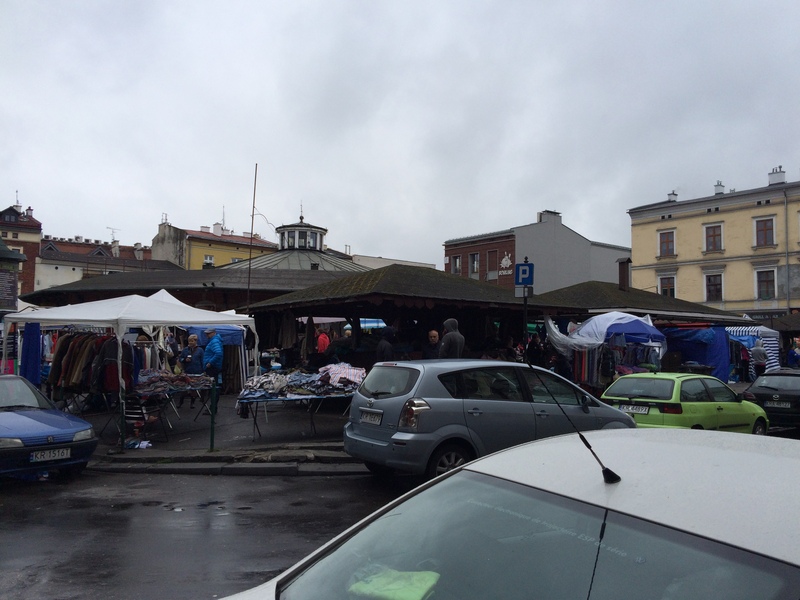 We walked to the market in the main square of Krakow where we had planned to go on two group walking tours that day, one of the Old Town, the other of the Jewish quarter. 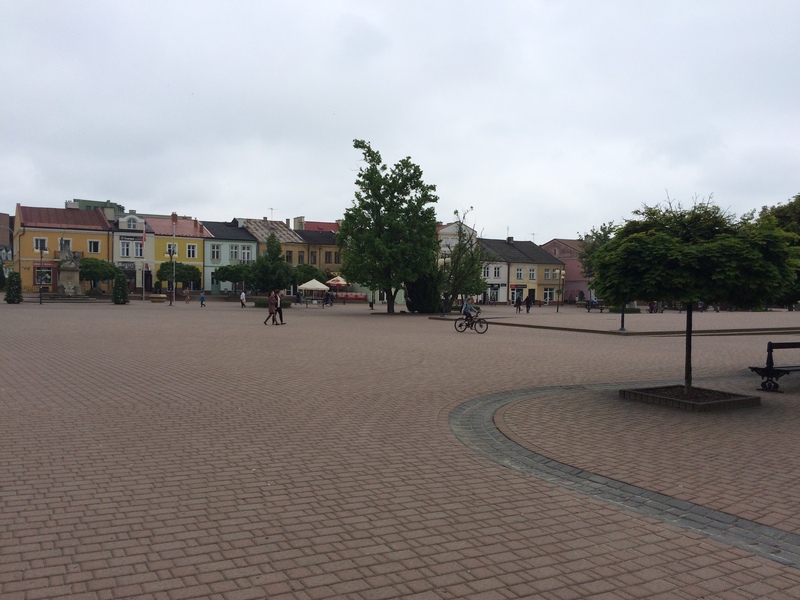 When we got to the main square, vendors were just starting to open their stands, and the square itself was fairly empty. 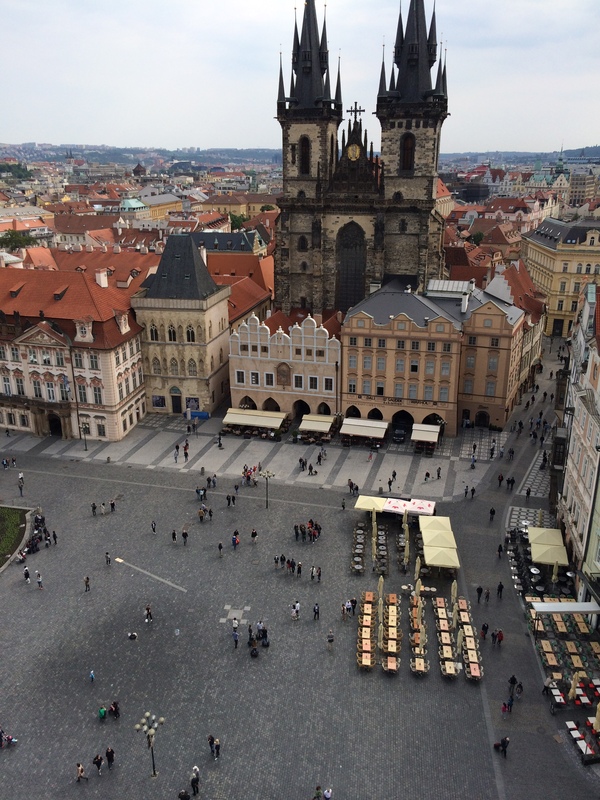 The square is magnificent in size—reportedly, the largest public square in Europe. 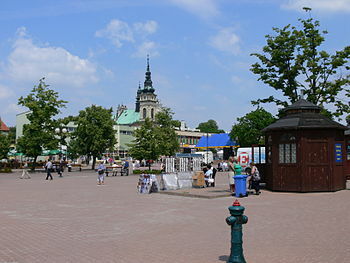 There are cafes and shops surrounding the square as well as a number of churches and government buildings. We wandered around a bit, and there was almost a Fanueil Hall feel to the place—a large indoor market lined with souvenir stands. Unfortunately, the weather really was not great, but we did take a few photographs. After some deliberation, we decided to go on a tour of the Jewish Quarter in the morning and Old Town in the afternoon with SeeKrakow. Our tour guide was a middle-aged Polish man who spoke English well, and the group of about sixteen people was quite diverse in background. We were the only people from an English speaking country. There were people from Spain, France, Belgium, and Switzerland. They all understood English; it was embarrassing. We were the only people in the group who could not speak a second language. Most of the others could speak three. The American educational system is an utter failure in preparing our children for the global world we live in. Anyway, we marched off with our leader (whose name escapes me, perhaps for good reason), and after a few stops, I realized that he was not a good fit for me. Maybe it was the contrast to Andrea and Helena, our guides in Prague; maybe it was the nature of being on a group rather than private tour. The tour leader was knowledgeable and pleasant, but I felt that he had a personal agenda to promote instead of providing an in-depth and historical view of the Jewish Quarter. Over and over his message seemed to be that Poland had always been tolerant and accepting of its Jewish citizens and that the Polish people were also victims of the Holocaust. What he said is historically accurate in many ways, but it was the way he delivered his message and his seeming defensiveness that troubled me. After about the first hour, I started to think that (a) I didn’t want to go on the Old Town afternoon tour with this guide, and (b) I didn’t want to continue on the Jewish Quarter tour with this guide. When we realized that his tour would not give us a chance to enter into any of the synagogues we passed (which he did describe, but at times showed us only the back or side of the building), we made a decision to leave the tour and explained to the guide that we wanted to spend more time in the Quarter rather than continue with the group. 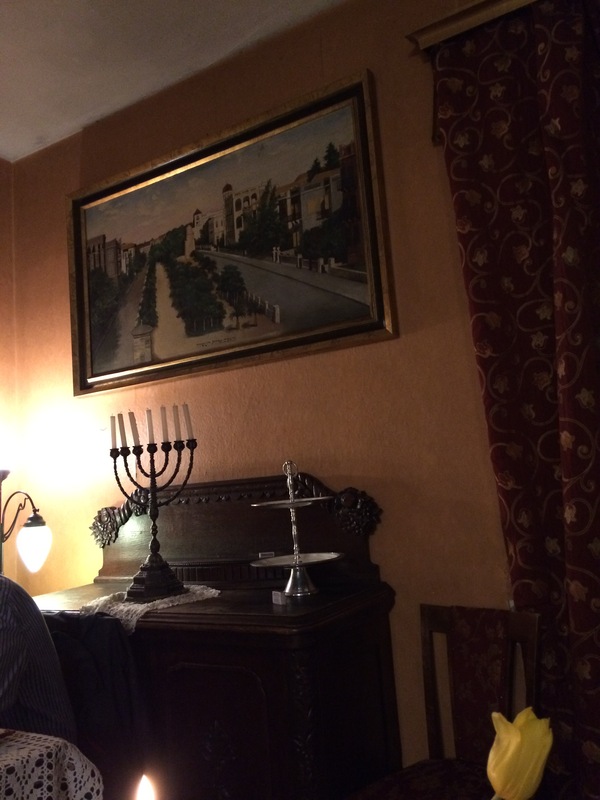 Unfortunately, I had made one serious error in planning our itinerary—I had failed to check a Jewish calendar beforehand, and I had not realized that our one day in Krakow would be the holiday of Shavuot. That meant that many of the synagogues, at least those still operating as synagogues, would not be open to the public for tours that day. (It was also the Catholic holiday Pentecost, meaning that many stores and offices were also closed that day.) 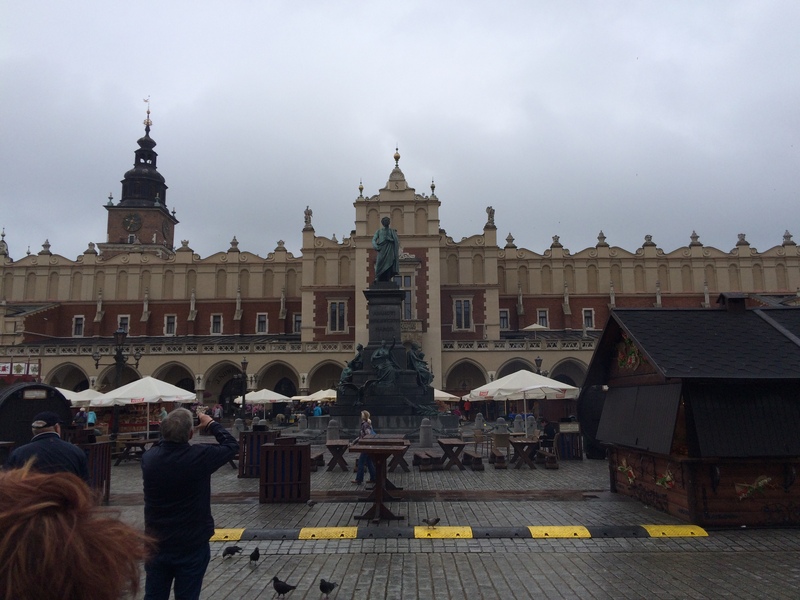 If I could have changed one thing on our trip itinerary, I would have added at least another day to our stay in Krakow—not only because of the conflict with Shavuot, but also because we just did not have enough time to do the city justice. But when you are traveling, you do what you can do. 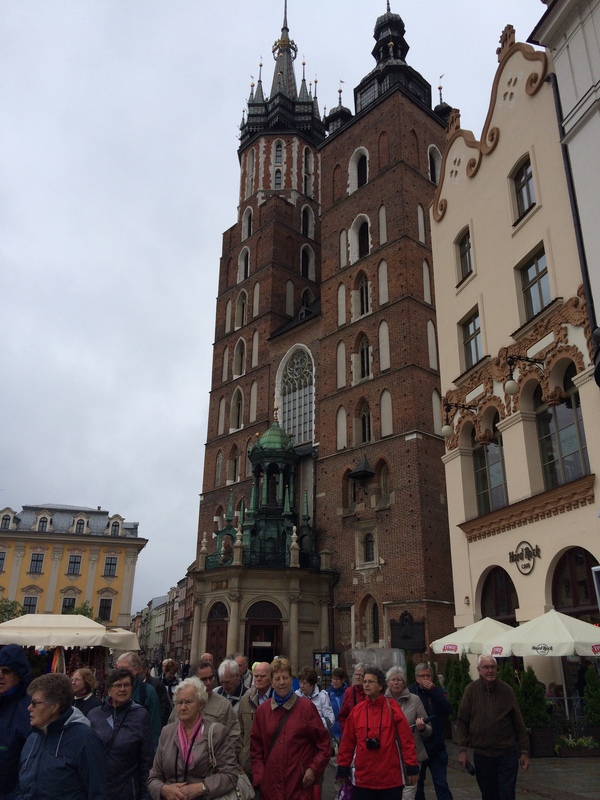 So over lunch, we realized that we did not have time to see many of the sites in Krakow outside the Jewish Quarter—the Wawel Castle and the churches and other buildings we’d only glimpsed in Old Town. We also realized that our sleepless night was catching up with us. So we spent the afternoon wandering through the Jewish Quarter, soaking up what we could, and visiting the places we could enter. 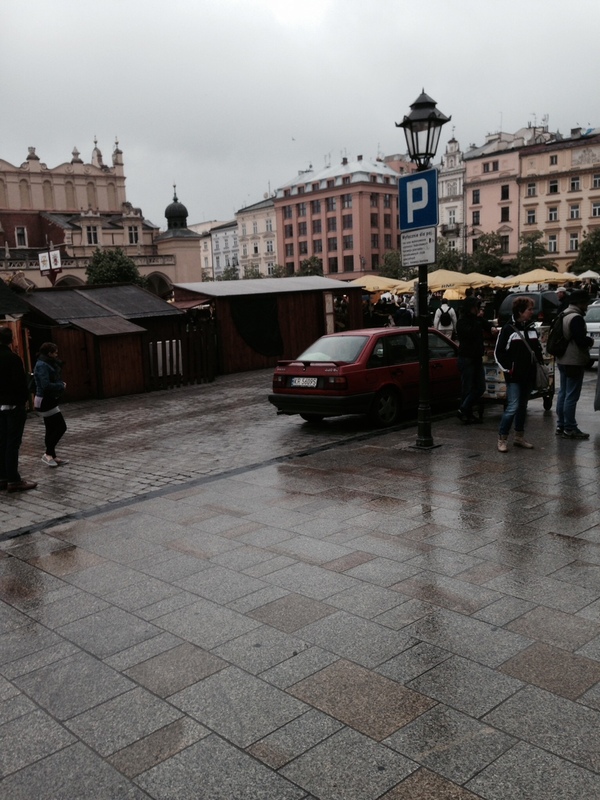 I hope that someday we can return to Krakow and see the city in more depth. 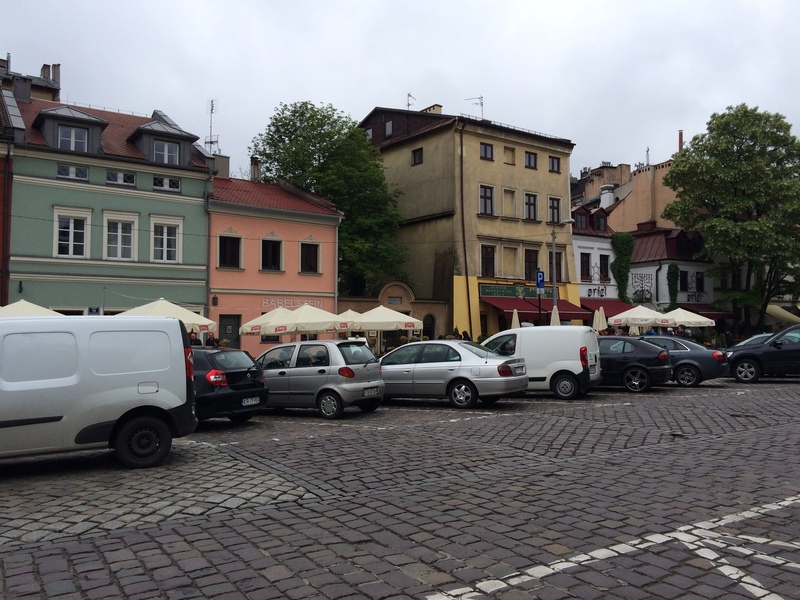 Unlike the Jewish Quarter in Prague, which as I wrote was substantially torn down in the late 19th century, most of the structures from the original Jewish Quarter in Krakow are still standing—the winding cobblestones streets and old worn buildings have been there for hundreds of years. 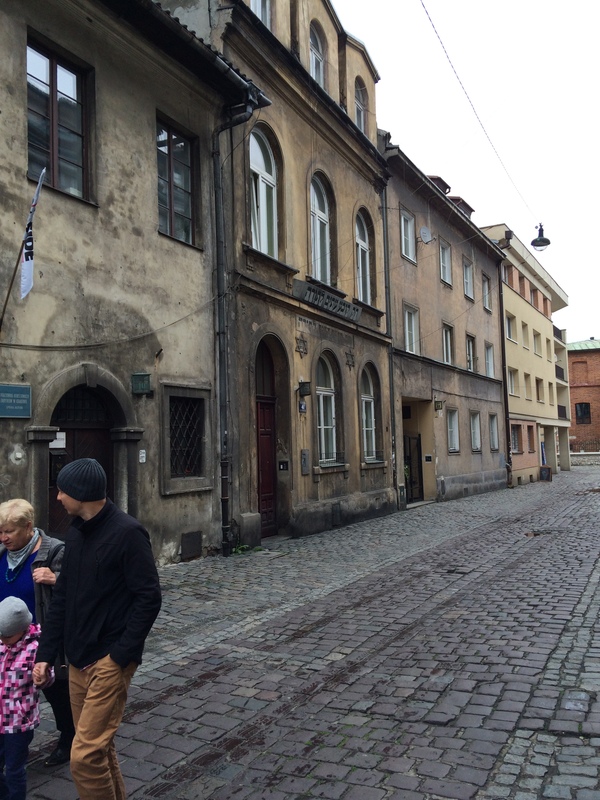 As our guide said, Krakow’s Jewish quarter is much more “authentic” than that in Prague because it reflects the way the ghetto looked when it was a ghetto. It also reflects more of the wear and tear of time, neglect, and the war. 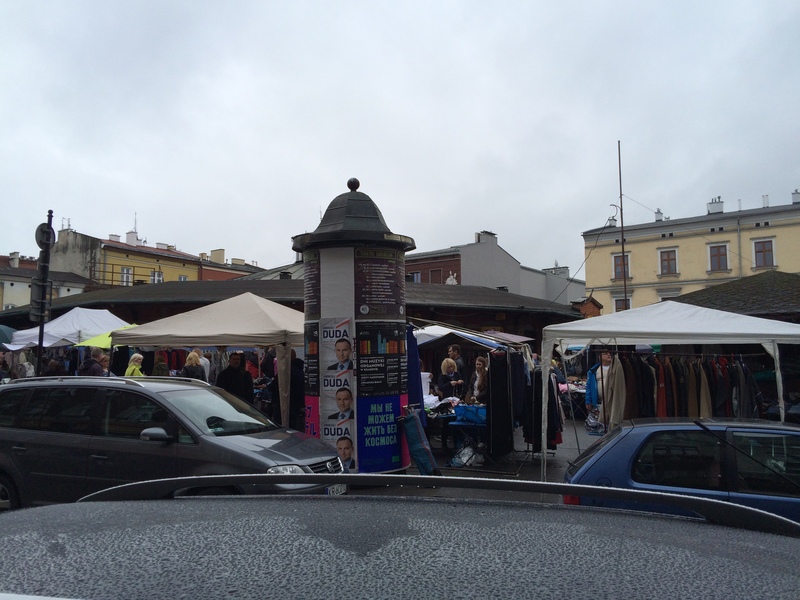 Here are some photos of the square where the Jewish market once operated; it still operates as a market—a flea market when we were there, although, of course, there are no Jewish vendors or customers today. 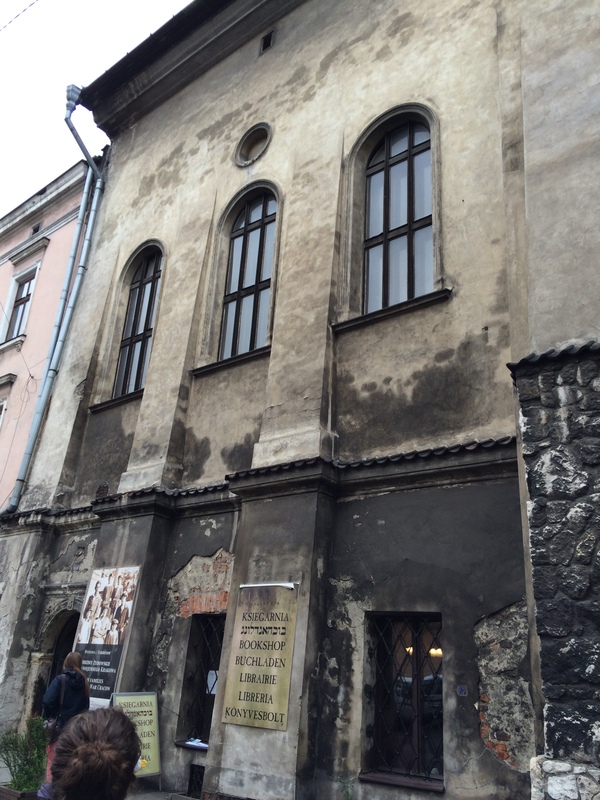 We saw six still-existing buildings in the Krakow Jewish Quarter that were once operating synagogues. As with the synagogues in Prague, the only reason they are still standing is that the Nazis found the spaces useful for storage. 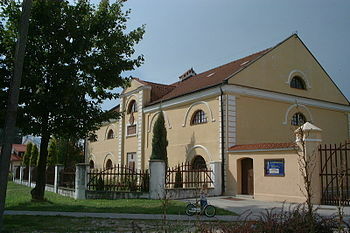 The oldest of the existing synagogue buildings, appropriately referred to as the Old Synagogue, was built at the beginning of the 15th century. 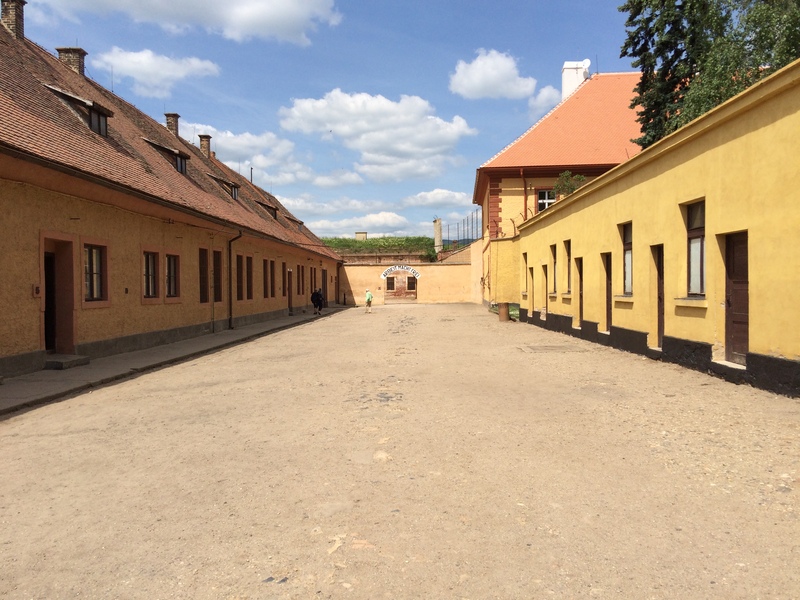 Its interior was destroyed by the Nazis, and it was then used for storage during their occupation of Poland. 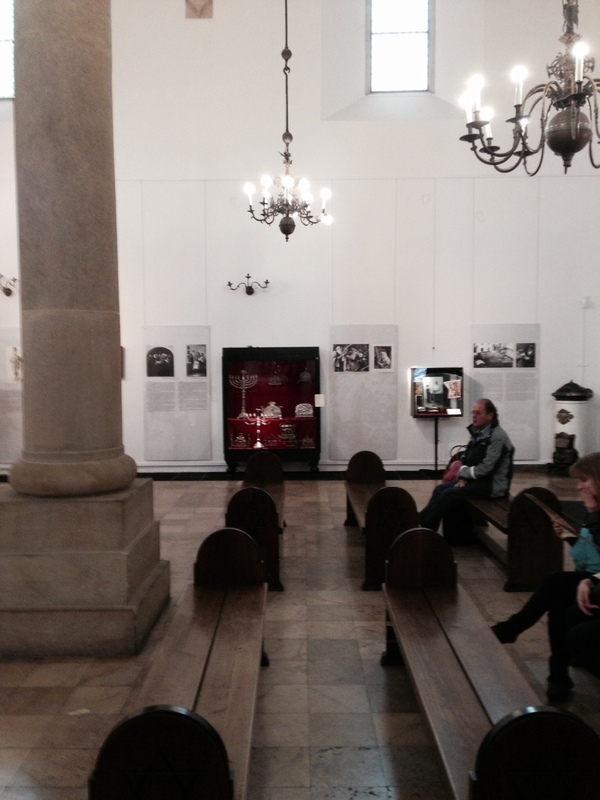 Today the building is operated as a museum, displaying Jewish ritual objects and a historical exhibition of Krakow before and during the Nazi occupation. 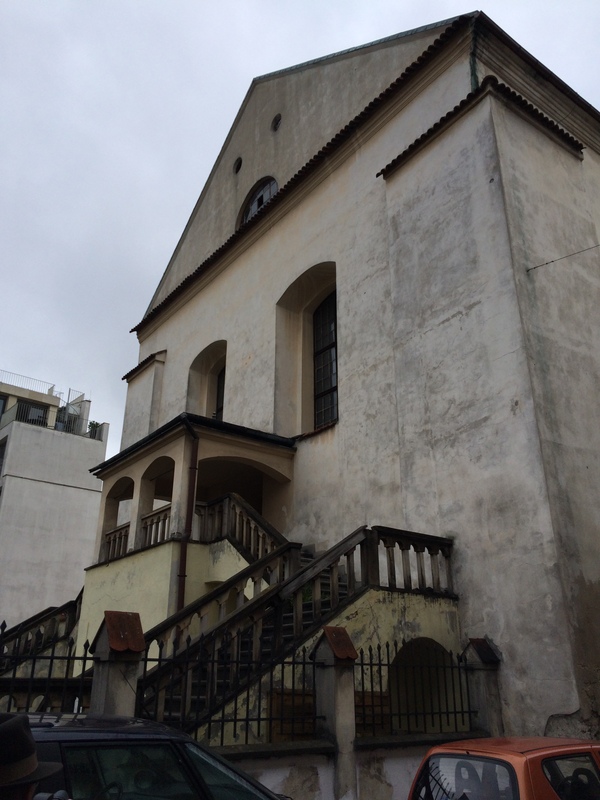 The second oldest synagogue still standing is the Remu’h Synagogue. 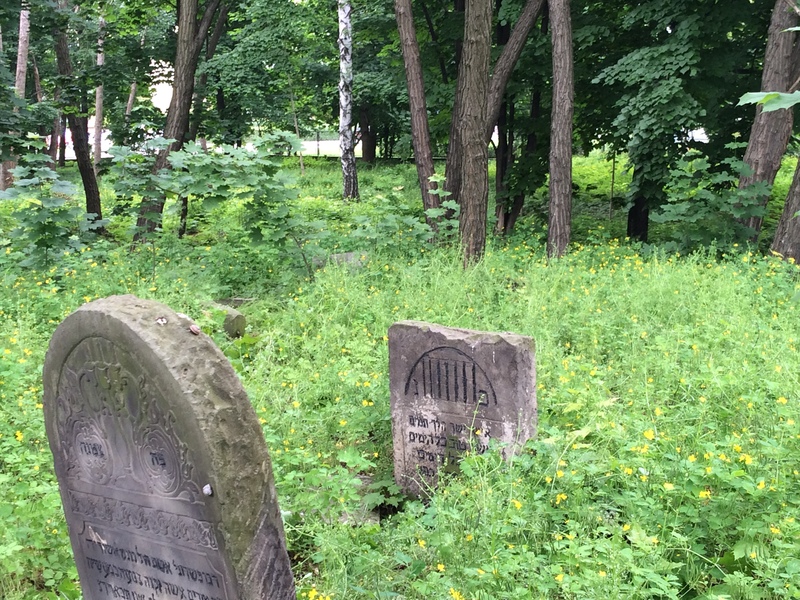 It is still an active congregation, so we were not able to enter it during our visit, nor we could enter the Old Jewish cemetery that is located adjacent to the synagogue building. All I could get was the one photograph through the gate. 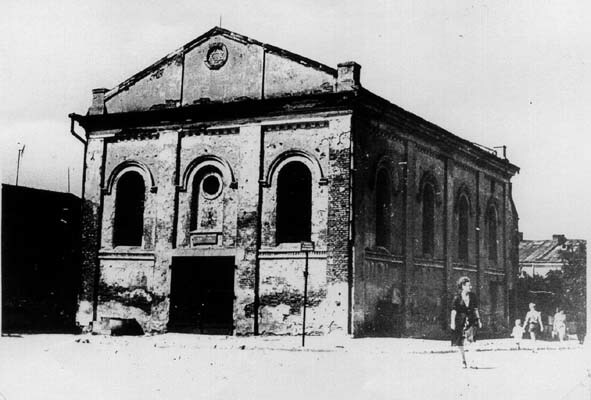 The Remu’h synagogue was built in the mid-16th century, and its interior also was substantially destroyed by the Nazis and then used for storage. Both the Old and the Remu’h synagogues are located on what was the main square in the Jewish quarter where today there are numerous restaurants, many providing “Jewish” dishes on their menus (but not kosher) and klezmer music at night. It’s a very pretty square, but the faux Jewishness is clearly intended to manipulate Jewish tourists like us, coming to see a world that no longer exists. 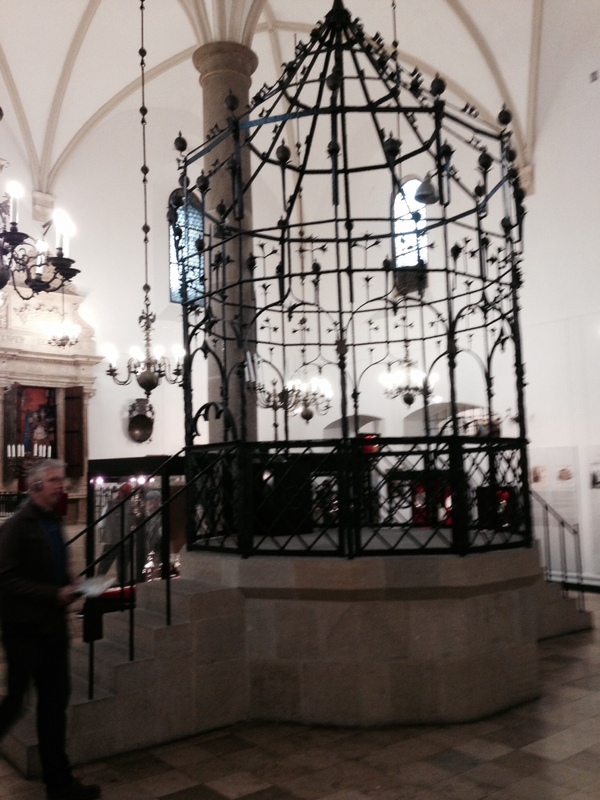 The High Synagogue was the third synagogue built in Krakow, sometime after the Remu’h but also in the 16th century. 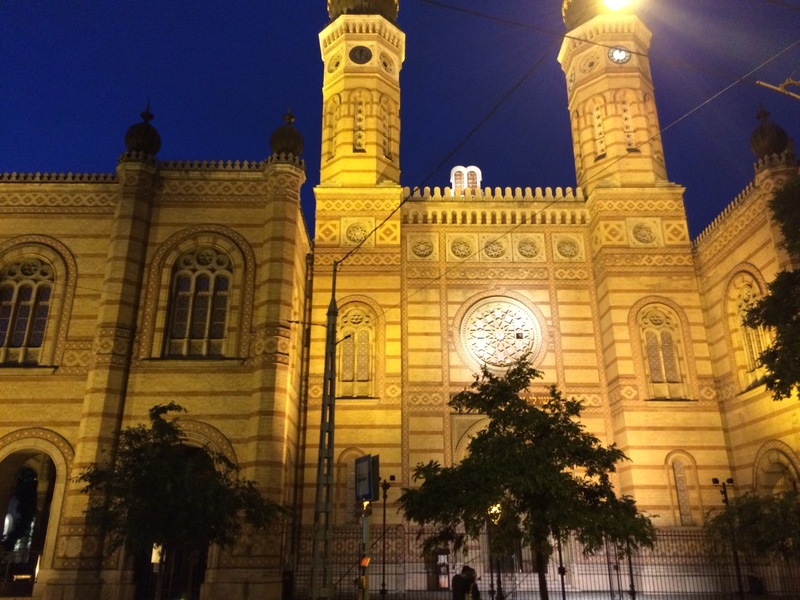 It was called the High Synagogue because the prayer hall was located upstairs. We were able to climb those stairs and visit the former prayer hall because today it is a museum. The exhibit there was very moving. Several families of former Krakow Jews provided photographs to the museum of their families, depicting what their lives were like in the 1920s and 1930s before the Nazis arrived. I was surprised to see very modern-looking families, engaged in activities like skiing and boating, as opposed to the images I had had in my head of ultra-Orthodox men with payes and long black coats. 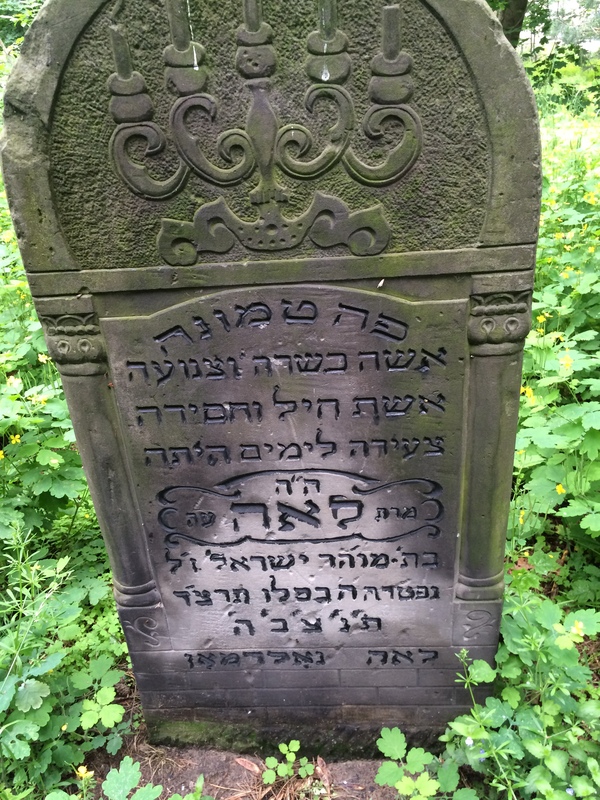 As in Prague, by the early 20th century Jews in Krakow were full citizens, no longer required to live in a ghetto. Many were quite successful merchants, and their families lived very comfortable and modern lives. Of course, it doesn’t matter whether they were Hasidim or assimilated, but I have to admit it made it easier for me to identify with these people, knowing their lives were not unlike mine. Reading the stories of what happened to these families was heartbreaking. Even though someone survived in these families and was thus able to preserve the photographs and the stories, each of these families lost many members during the Holocaust. 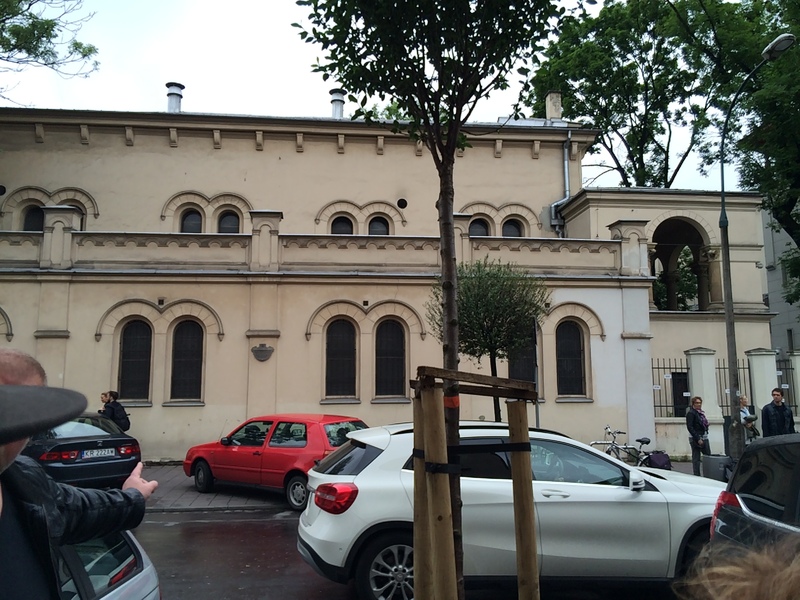 The only other synagogue building we could enter was that of the former Kupa Synagogue. 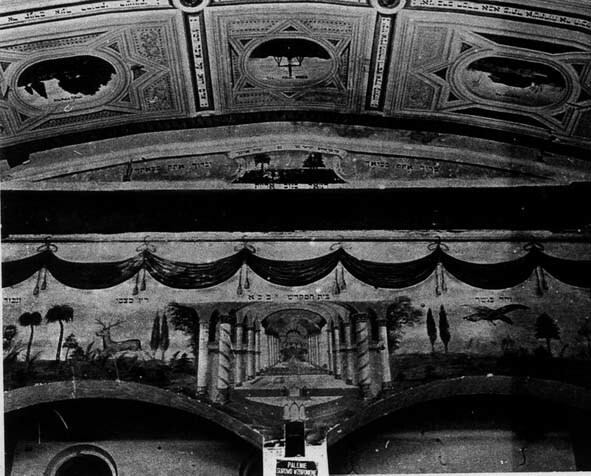 It was built in the 17th century, and like the other synagogues, was severely damaged by the Nazis. We were able to enter the building and see the prayer hall, where people seemed to be setting up for some event. We are not sure exactly how this synagogue is used today since it was open for visitors on the holiday. 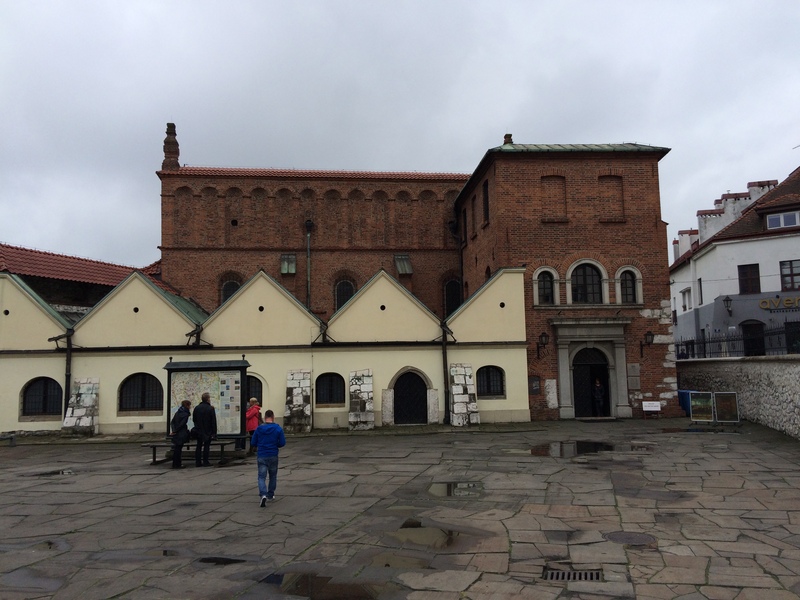 We also stopped to see the outside of the Isaac Synagogue, also built in the 17th century and now the headquarters for Chabad in Krakow, and the newest of the synagogues, the Tempel Synagogue, a Reform synagogue built in the mid-19th century. Neither was open to visitors. 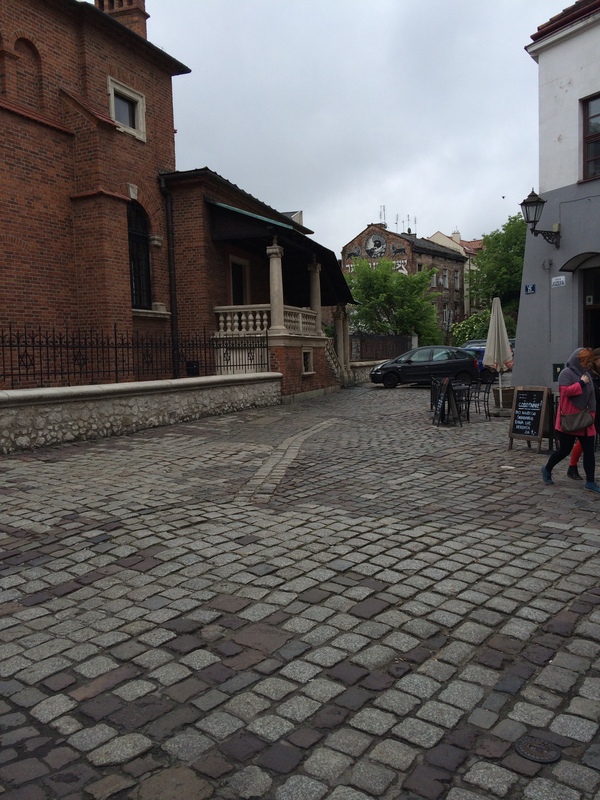 But next to the Tempel Synagogue is the JCC of Krakow, which was open and where we spoke with a woman at the reception desk. She told us that they have 500 members, although only 120 are “registered” Jews. 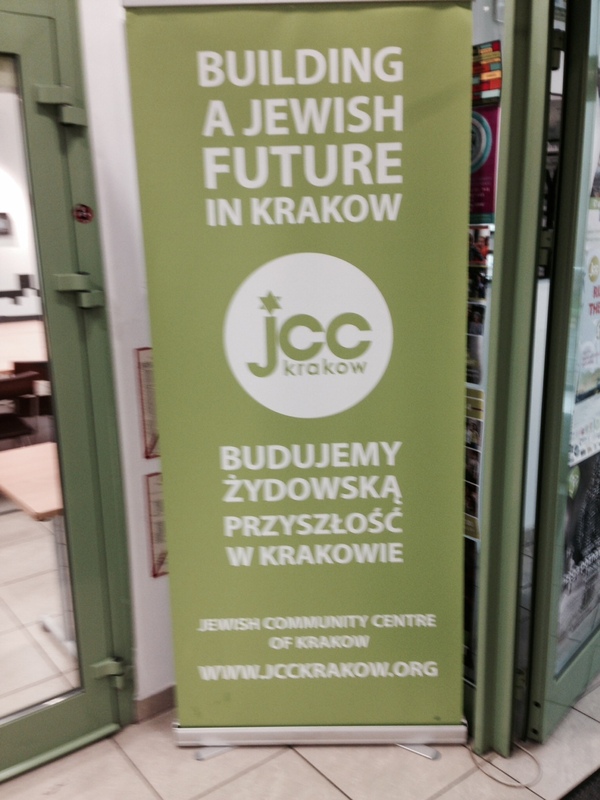 The JCC provides educational and cultural programming, Shabbat dinners, and holiday celebrations, and aims to revive a Jewish community in Krakow. It was uplifting to be in this new building and see some signs of hope for the very small Jewish community that exists today in Krakow. We ended our walk through the Jewish Quarter on that somewhat high note. 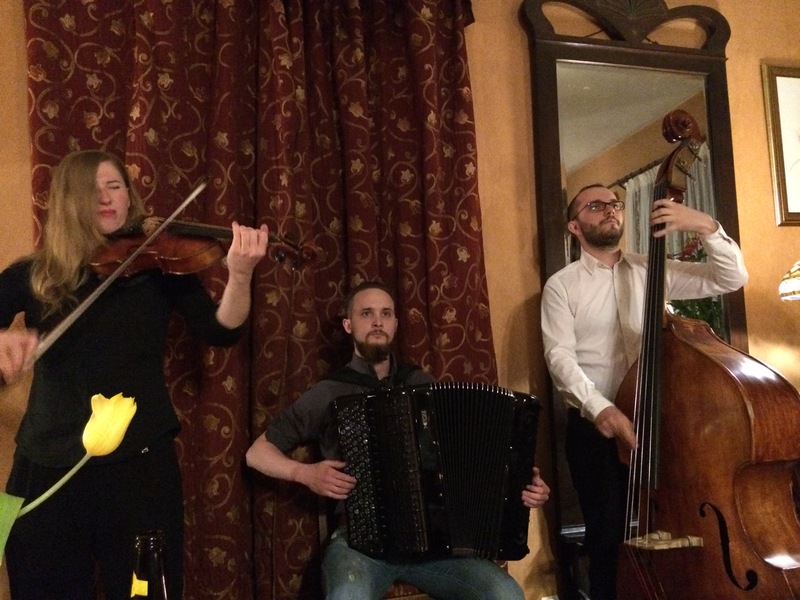 We later returned for dinner at the Klezmer Huis, where we ate “Jewish-style” food and listened to Klezmer music (sung by three young people who I assume are not Jewish, but who were excellent). But although that was fun (if somewhat corny), it did not really cover up the reality. Before World War II, there were about 65,000 Jews in Krakow, and they made up about 25% of the city’s population. Today, as I said, there are 120 Jews living in Krakow. Walking those streets and seeing the old houses once occupied by Jewish families, entering those once flourishing synagogues that are now just museums, seeing those photographs of the families who were destroyed, I could not help but feel thousands of ghosts following us around. 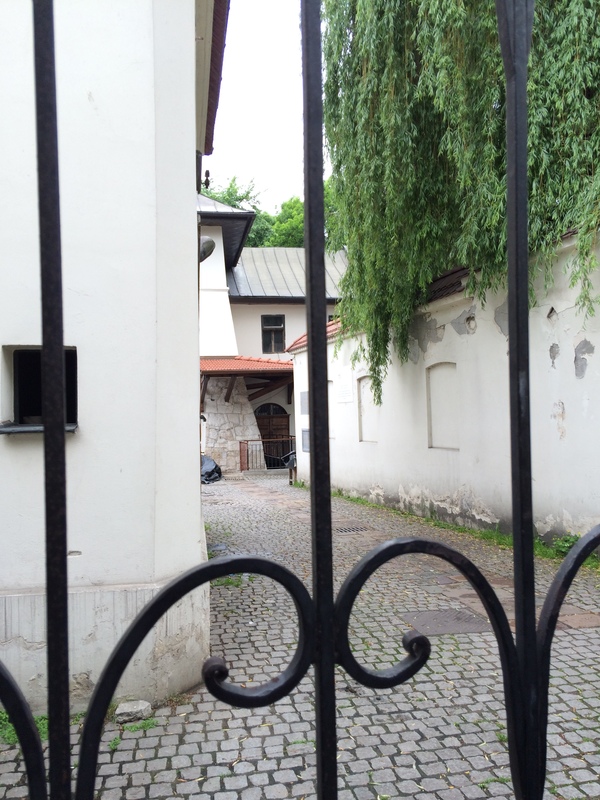 What would Krakow be like today if the descendants of those 65,000 people were alive? 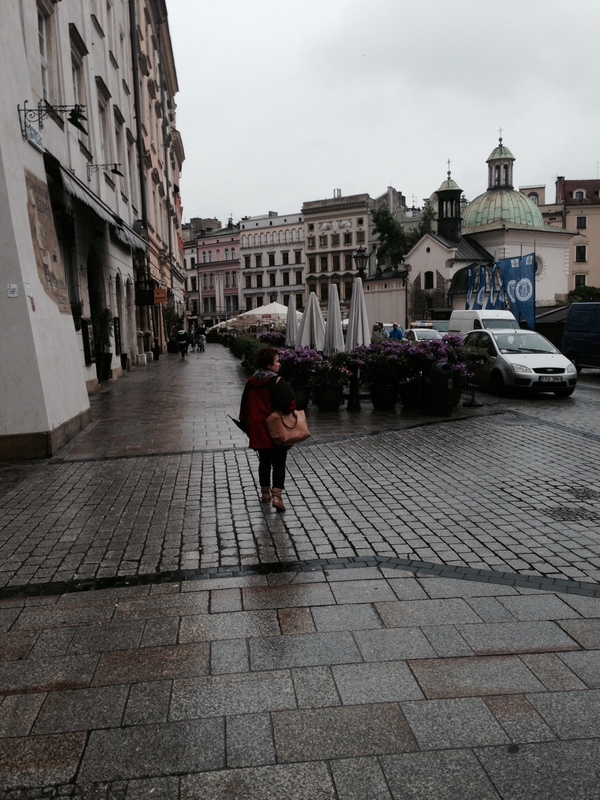 My day in Krakow left me angry and very sad. The second day of our visit to Poland we learned more about what happened to those people. More on that in my next post. 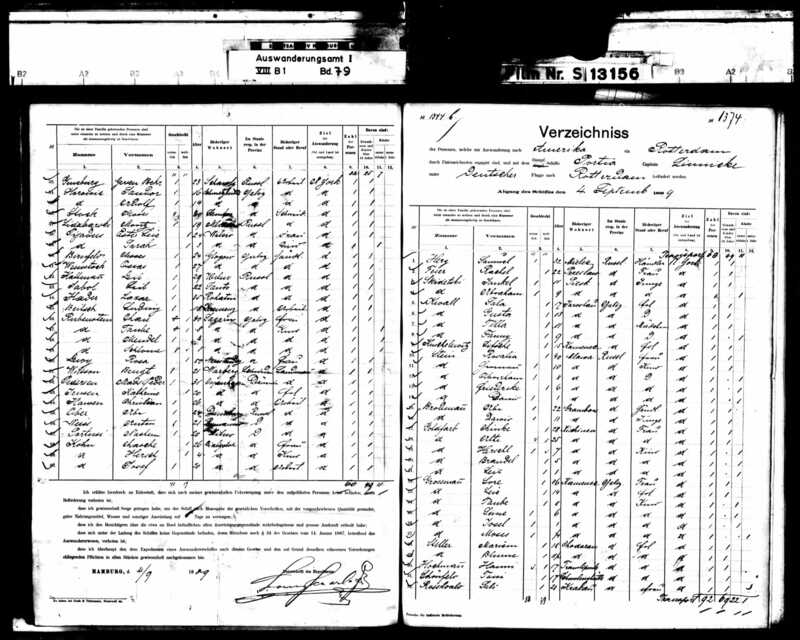 As I’ve been researching and writing about my American Seligman relatives, I’ve also been busy trying to learn more about my German ancestors. I wrote to about five different people in Gau-Algesheim, names I found on websites or through contacts from JewishGen or two Facebook groups, Tracing the Tribe and German Genealogy, including Klaus Cook. 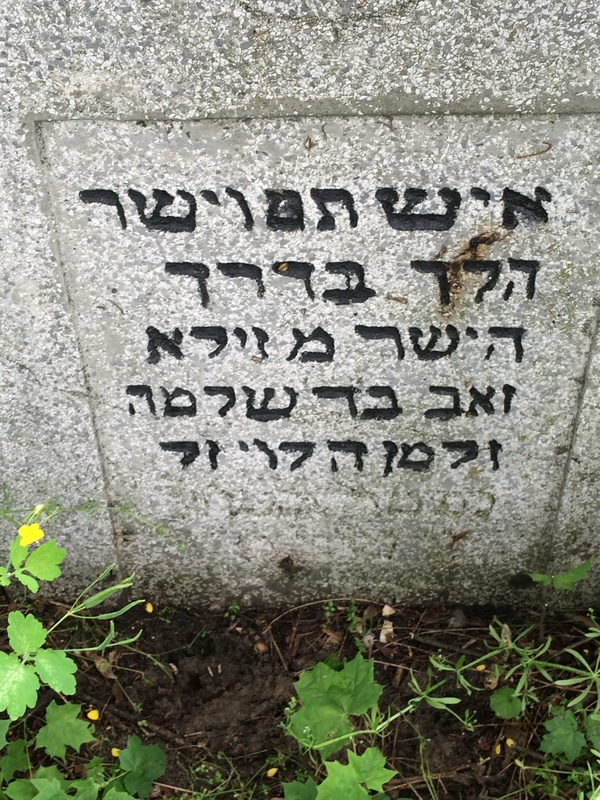 I’d been trying since September 7 to find someone to help me learn whether there were any records of Jewish births, marriages and/or deaths from the town where I knew Sigmund, Bernard and Adolph Seligman were born. I had gotten no responses—not even one saying that they had no such records. On behalf of our registrar, Frau Hemmkeppler, I am hereby replying to your genealogy request, which we have received on 15. Oct. 2014 via email. All the beforementioned persons are the children of Moritz and Eva Seligmann (born as Eva Schoenfeld). …. 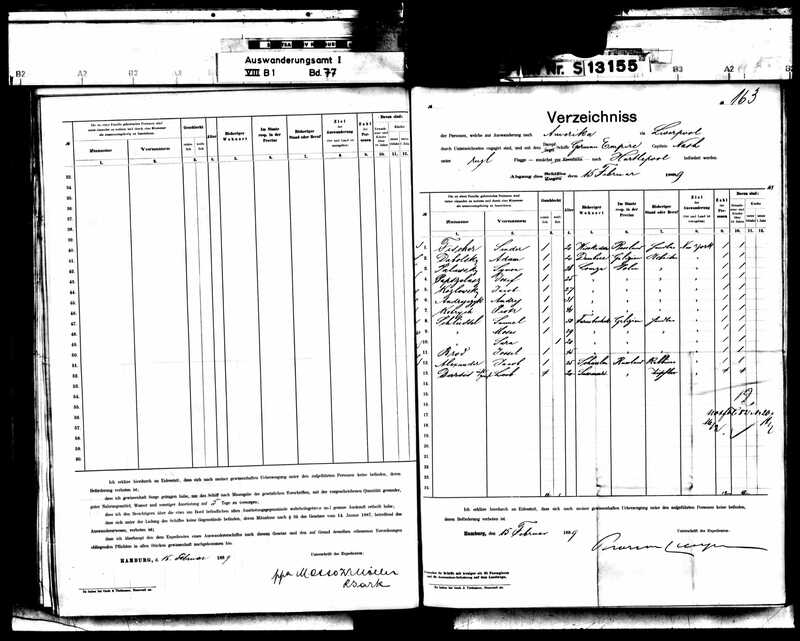 There was the birth record of my great-great-grandfather Bernard, his brothers Sigmund and Adolph, and seven other siblings, all born in Gau-Algesheim, all the children of Moritz and Eva Schoenfeld Seligmann. I was so excited. I now had seven more relatives to learn about and, most importantly, the names of my great-great-great-grandparents, Moritz Seligmann and Eva Schoenfeld. I have now been in touch again with Bernie Brettschneider and hope to obtain copies of these records and also to learn if there are any other records of these individuals or of others who might be their children, spouses, and so on. 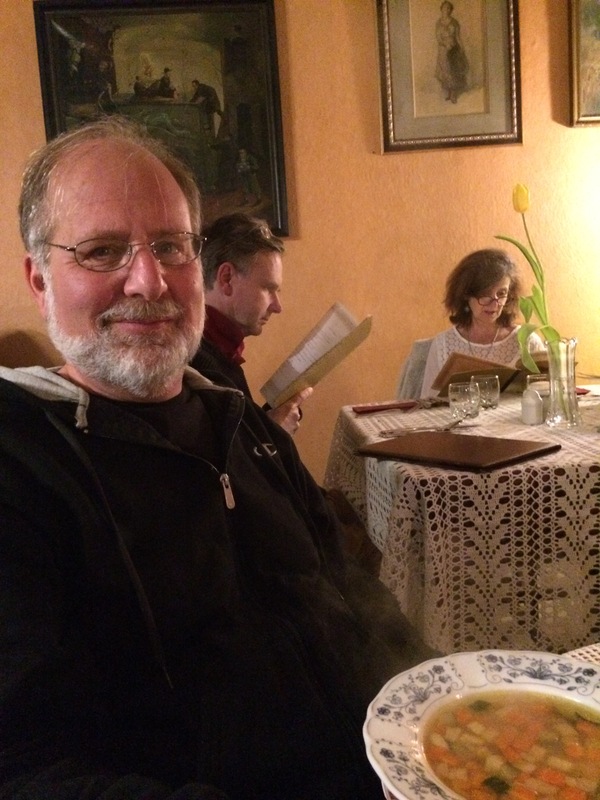 I am deeply grateful to Klaus Cook and the other people in the Facebook groups and JewishGen, to Dorothee Lottmann-Kaeseler and to Bernie Brettschneider for their assistance, and I am excited to see what else I can learn about this part of my family. 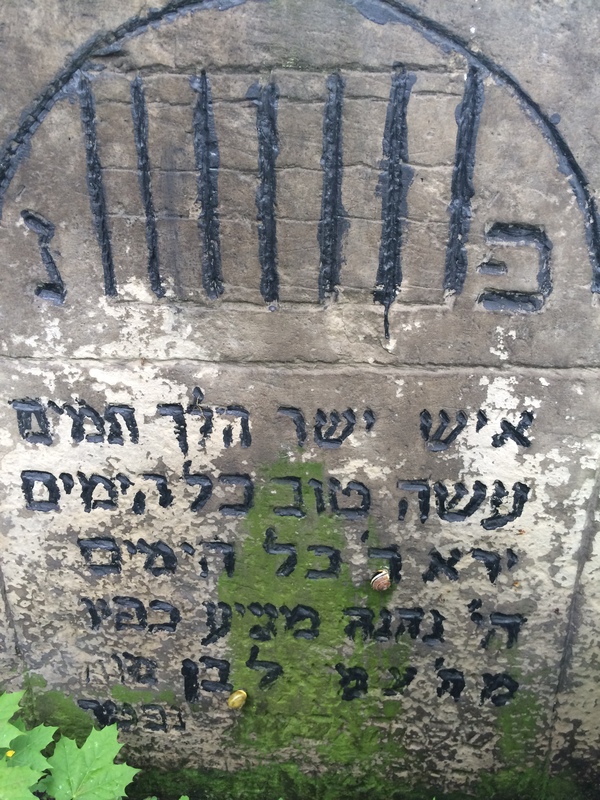 I am also in touch with Walter Nathan, who was the man behind the cemetery restoration in Gau-Algesheim. Walter and I are trying to find what connections there may be between my Seligmanns and his Seligmann family, and I am learning more and more about how Jews lived in Germany in the 19th century. When I started down this path less than three years ago, I never imagined how much I would learn about the world and its history by simply researching my own little family. I never imagined I would make contact with people in Germany and Romania and Poland, have cousins all over the world and talk to people whose lives have been so interesting. The gifts I receive from genealogy continue to surprise me and warm my heart. 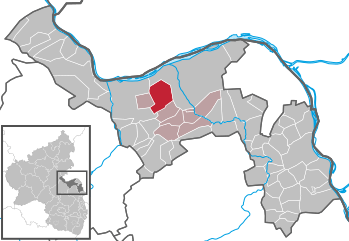 And I now am thinking that someday in the not too distant future I will visit Gau-Algesheim and see where my Seligmann ancestors lived. 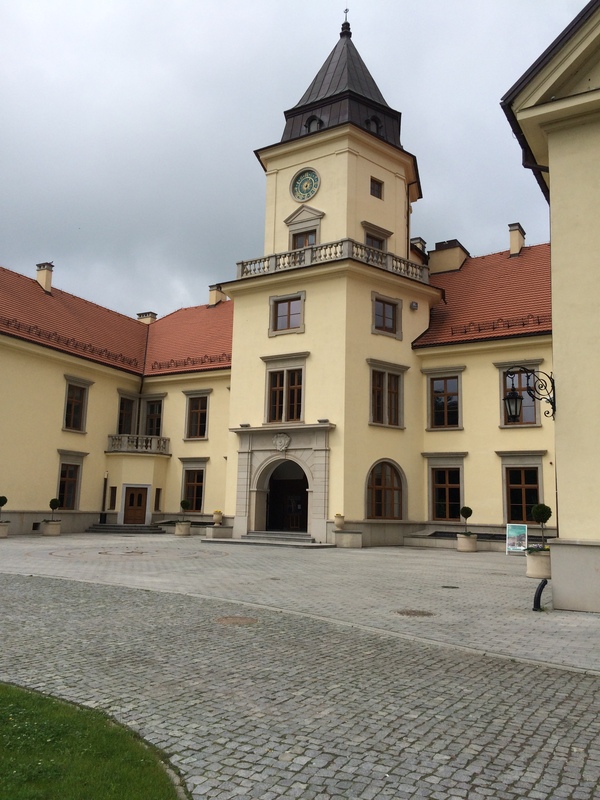 And Iasi to see where my Goldschlager and Rosenzweig ancestors lived. 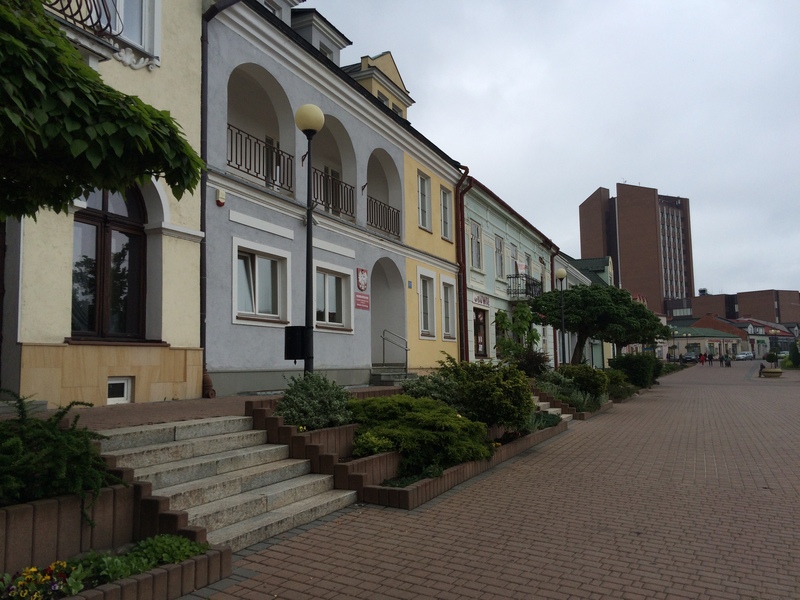 And Tarnobrzeg, Poland, to see where my Brotman ancestors lived. In fact, that last one is being planned for this coming spring. And then there are all the places right here in the US where I can go to walk in the places where my ancestors lived—New York City, Philadelphia, Washington, Santa Fe, Colorado, and who knows where else? The adventures continue. of where in Galicia my ancestors Joseph and Bessie Brotman lived. 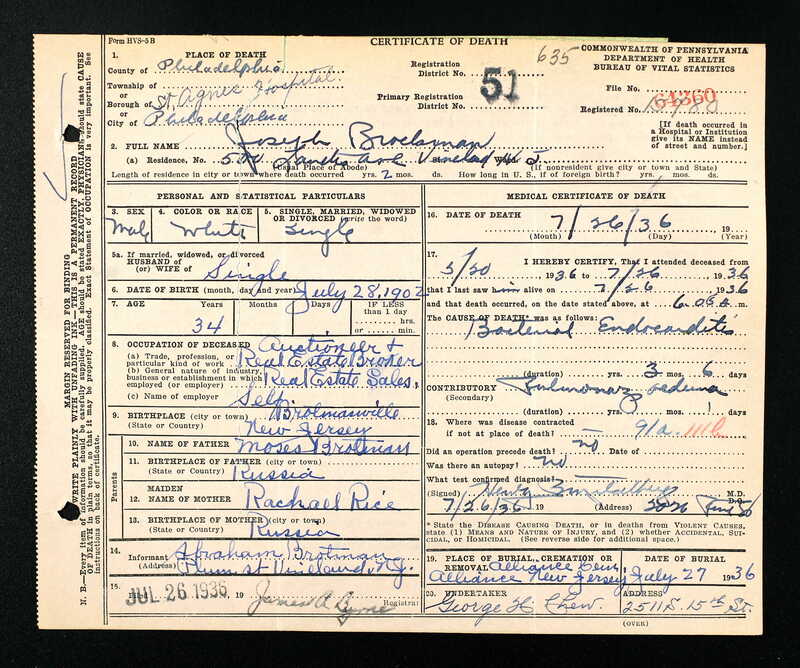 The discovery of David Brotman, Joseph’s son from his first marriage, provided a new jumpstart to that research because David had listed two different home towns on his documentation: Tarnof on the ship manifest and Grambow on his naturalization papers. Unfortunately, that information seemed to conflict with what I had from Hyman’s papers—Jeekief and Giga. After consulting with a few people in the field, my best guess is that the family came from Tarnobrzeg, then called Dzikow. 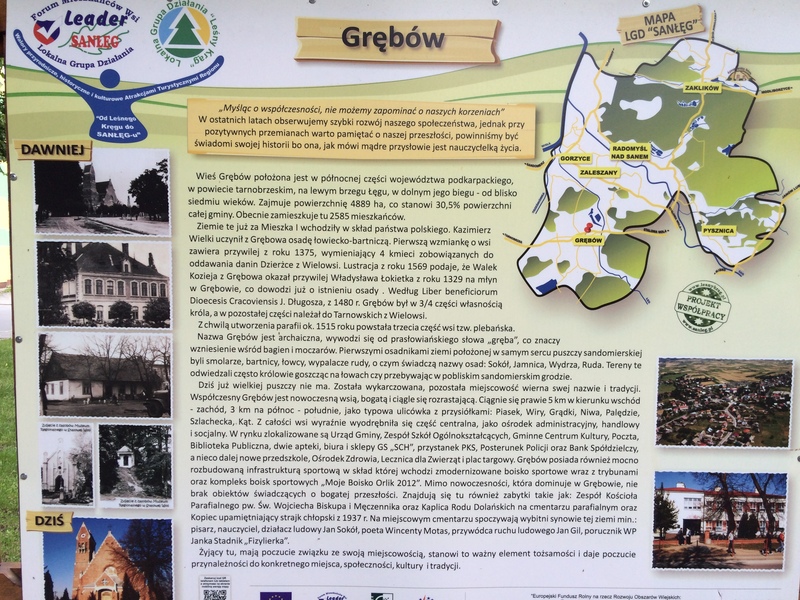 A town called Grebow or Grybow is close by, and I am wondering whether David was born in Grebow, near Tarnobrzeg, when Joseph was married to Chaye Fortgang, and that Joseph moved to Dzikow/Tarnobrzeg when he married Bessie and when Chaim/Hyman was born. It’s a guess, but it’s the best I think I will be able to do, given the unreliability of the US records and our ancestors’ memories. 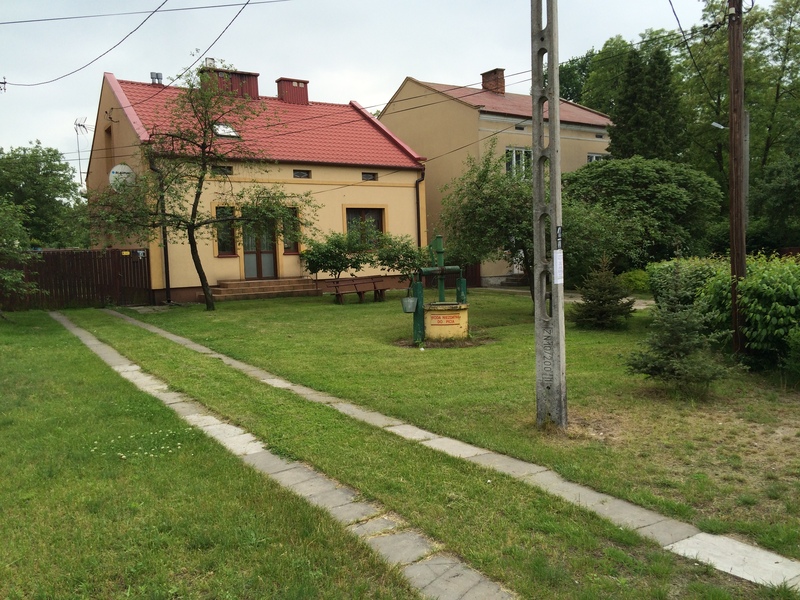 Having decided to make the assumption that Tarnobrzeg was the Brotman ancestral home, I then again researched the available resources online such as JRI–Poland, Gesher Galicia, and JewishGen, to see if there were any records that might be relevant, adding the surname Fortgang to my search since that is what David’s death certificate said had been his mother Chaye’s maiden name. I could not find any, and then I checked to see what records were even available in general for Tarnobrzeg. I wrote to Stanley Diamond, the creator of JRI-Poland, and this is what he informed me: “Among all the towns listed [on JRI-Poland], Tarnobrzeg is the one with the fewest surviving records. 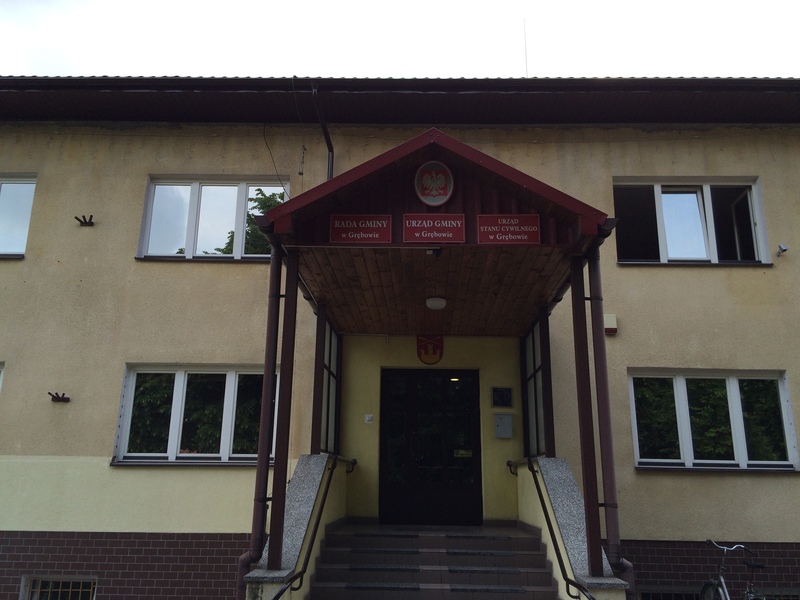 They are the 1889-1911 births that are in the Polish State Archive branch in Sandomierz (for which we now have digital images) and the 1912-1937 birth records in the town hall in Tarnobrzeg.” Obviously, all of those records are too late for our family as the last child born in Galicia was Tillie in 1884. 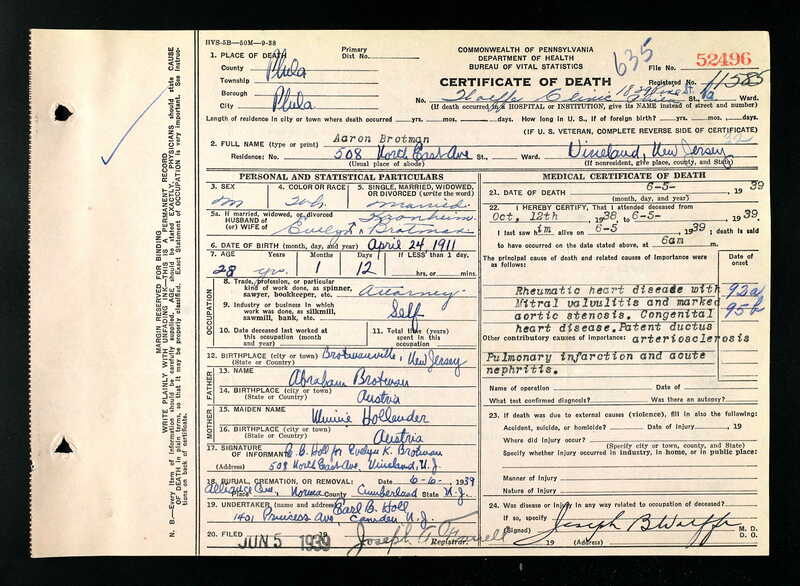 Just our luck—our relatives had to come from the place with the fewest surviving records. Stanley told me not to give up all hope—that new records are sometimes discovered over time. And I will certainly keep renewing my search periodically, hoping that something does turn up. But for now, I think I have to accept the limitations of our ability to learn everything about our past. So am I content with this? No, of course not. It’s particularly frustrating because it means I cannot go back any earlier than Joseph, Bessie and Chaye to find our earlier ancestors. 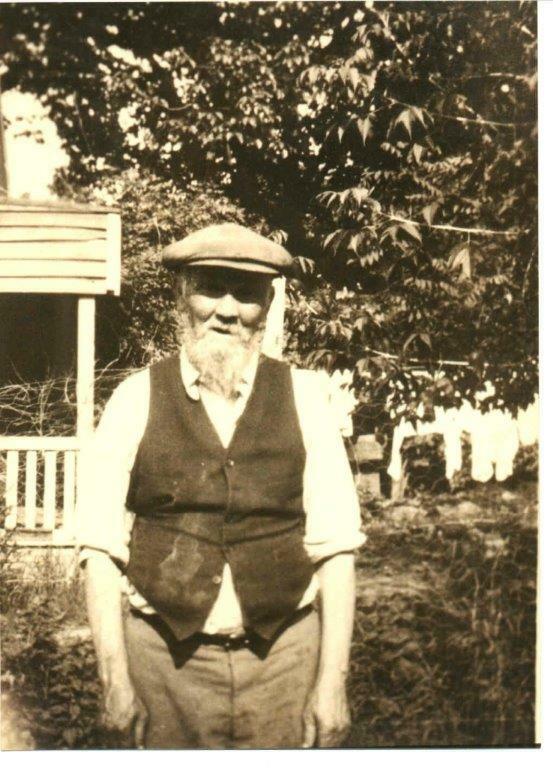 I think that I can learn to be comfortable saying that my great-grandparents Joseph and Bessie Brotman probably came from the Tarnobrzeg region of Galicia. That’s much better than what I could say last summer when I really started digging for answers. But being even 99% sure is not the same as knowing for certain, and I am not even close to 99% sure. 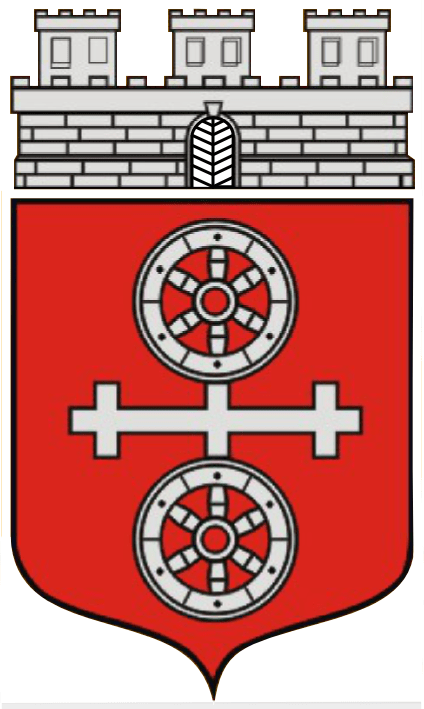 For those who are interested, here are two websites about Tarnobrzeg, the town where my great-grandparents Joseph and Bessie Brotman probably lived. Happy New Year to all my family and friends and followers and readers from all over! I can’t believe I’ve had readers from not only the United States, but Canada, Great Britain, Germany, New Zealand, Bulgaria, Sweden, Turkey, Ireland, Greece, Australia, Russia, Poland, and Israel. Thanks to all of you for stopping by, whether you have been here once or many times. May 2014 bring everyone peace, happiness, and good health. I am grateful to you all for your support and your readership, and I look forward to making new discoveries and new connections in the year ahead. I hope to learn more both from my relatives and from my fellow genealogy bloggers and others about genealogy, my family, and myself. As you may recall, on October 31, I sent a request to the USCIS for the naturalization papers for Max Brotman in the hope that they would reveal where Max and thus the other family members were born in Galicia. According to the automated message on the USCIS phone, it could take at least 90 days to get a response. Well, I figured the news wasn’t going to be good when I received a response yesterday only 35 days after making my request. And it wasn’t—they had no records for a Max Brotman who fit the dates I had submitted. 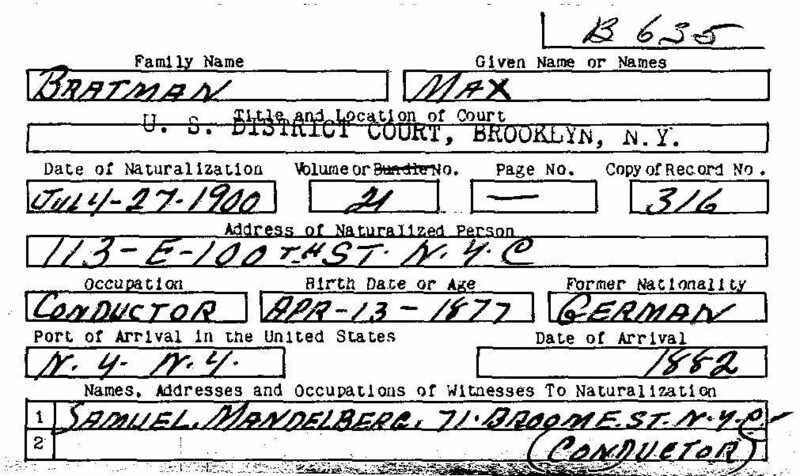 In fact, all their naturalization records start in 1906, and I should have known that Max was naturalized before 1906 since he was the witness for Abraham in 1904. 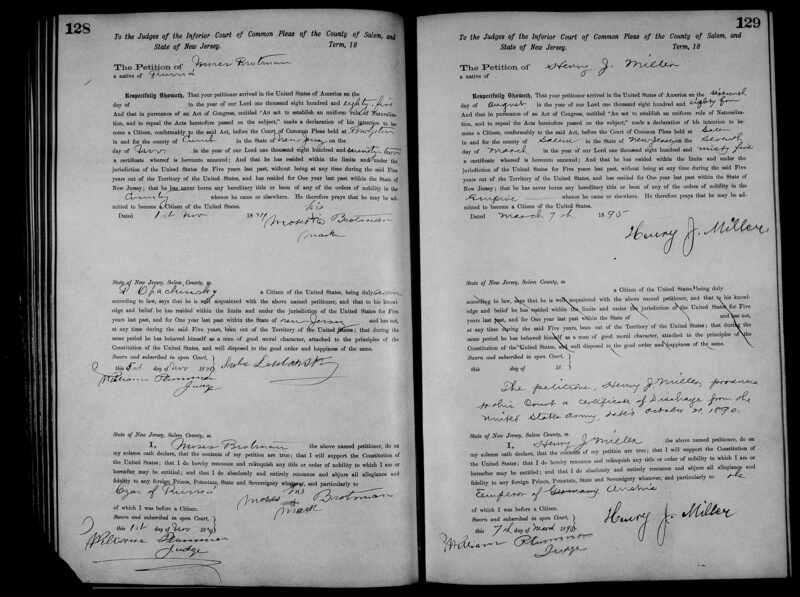 I then went back to ancestry.com and rechecked my search of their naturalization records where I had been able to find records for both Abraham and Hyman. I checked and rechecked pages and pages of indices, searching for anything that might relate. 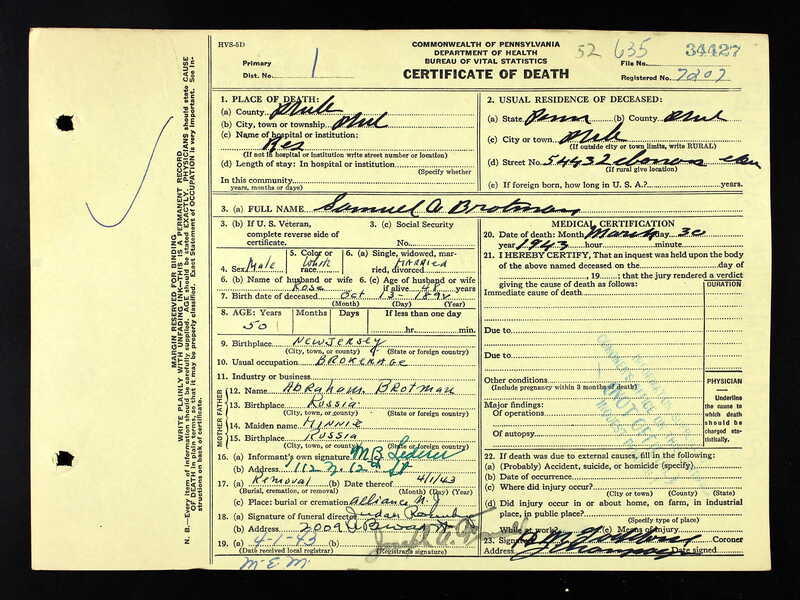 I found one for a Max Bratman born in Germany who worked as a conductor for the railroad and emigrated in 1882, but dismissed it because the name, place of birth, and date of immigration seemed wrong. 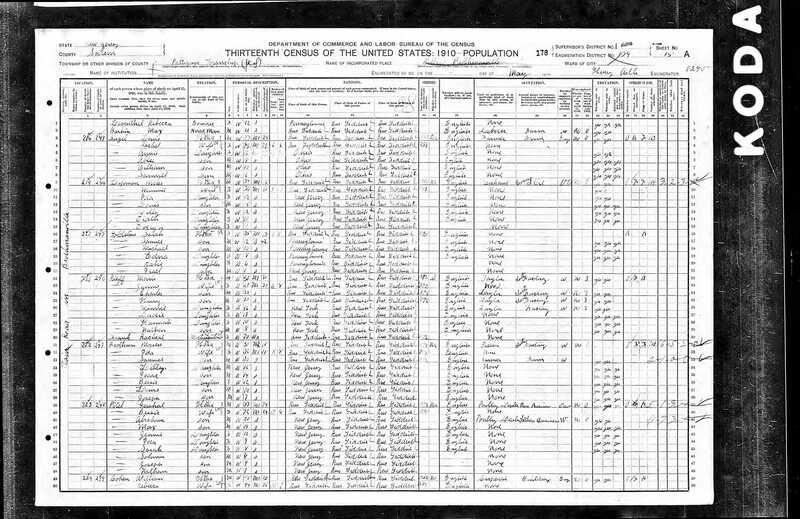 Then I went back to the records I already have for Max, including several census reports, his marriage certificate and his death certificate. 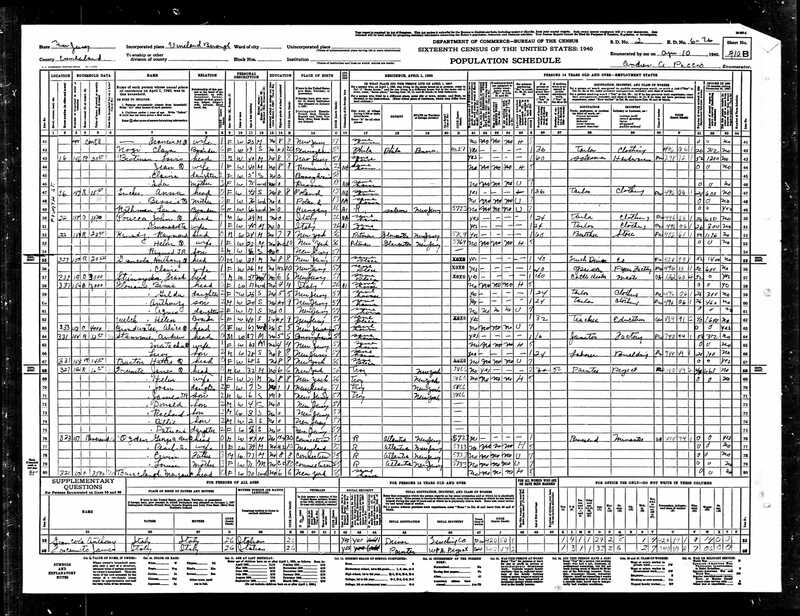 While reading through the 1900 census, I noticed that it said Max was a conductor. 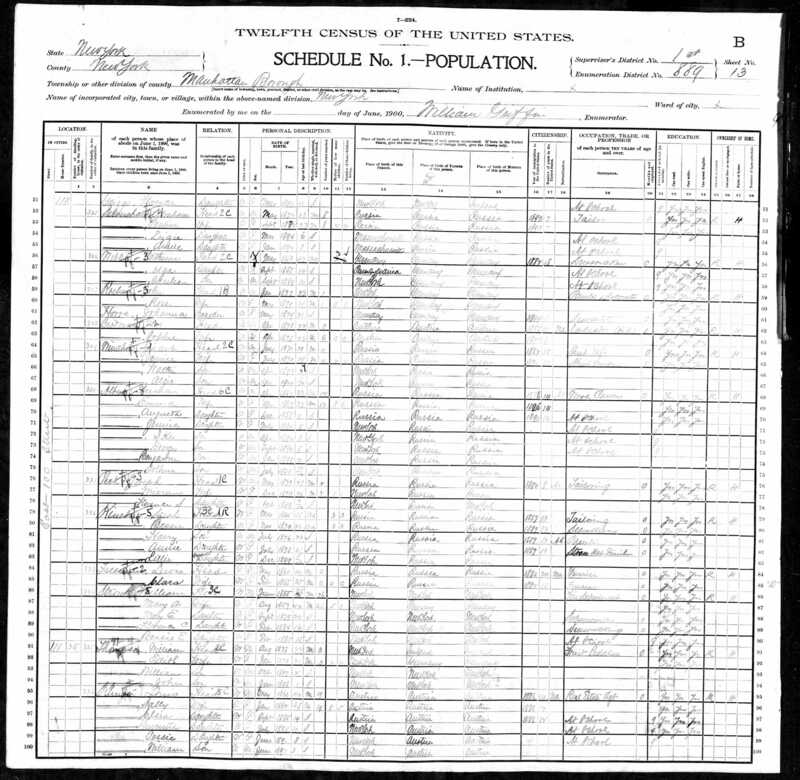 At that time he and Sophie were just married (the census was taken in June; they had married in April) and were living at 113 East 100th Street in Manhattan. 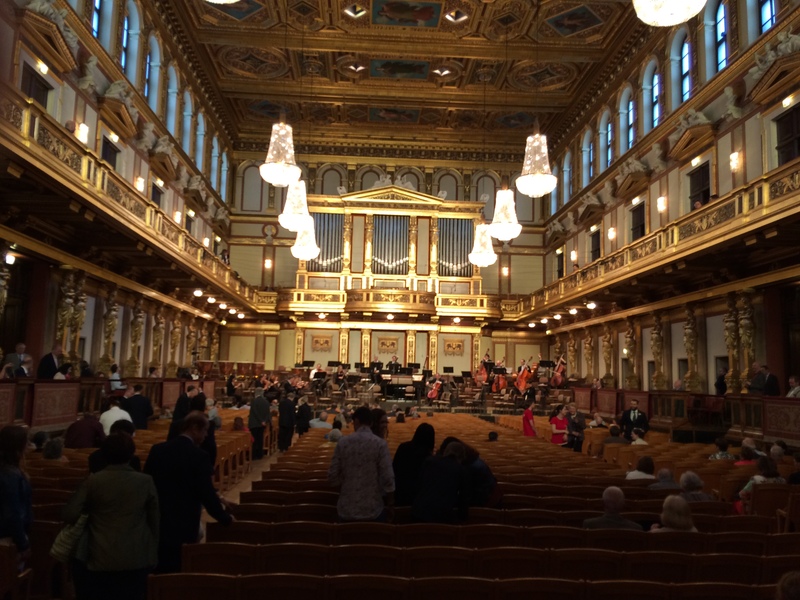 When I saw the entry that he was a conductor, I knew it rang a bell, but at that point I could not remember where else I had seen it. 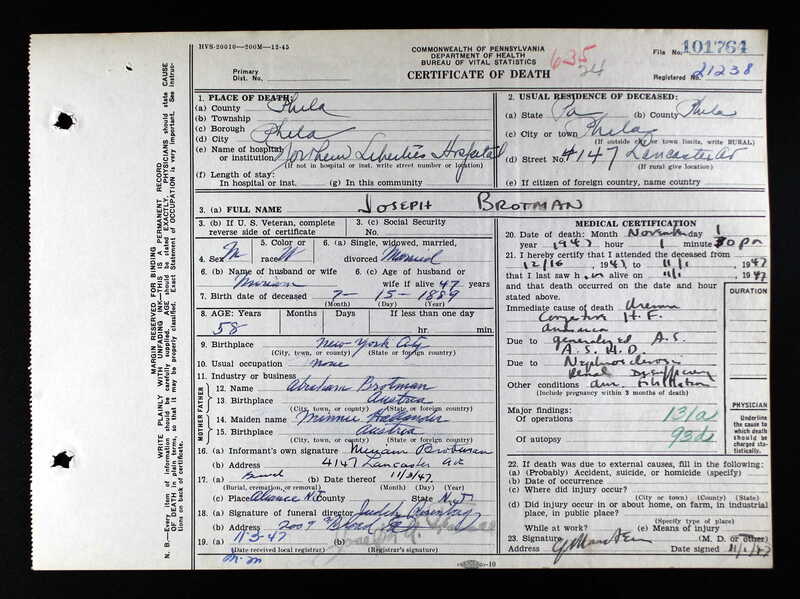 I began to search through the naturalization records again and could not find any reference to a Max Brotman who was a conductor. I started thinking that I was losing my mind! Then I remembered that there had been a Max BrAtman and searched for him, and lo and behold, found the naturalization card again for the conductor. I looked at the address on that form and sure enough, Max Bratman was living at 113 East 100th Street in Manhattan in 1900 when he filed this application. Obviously this was the same person, our Max, but why did he spell his name wrong? 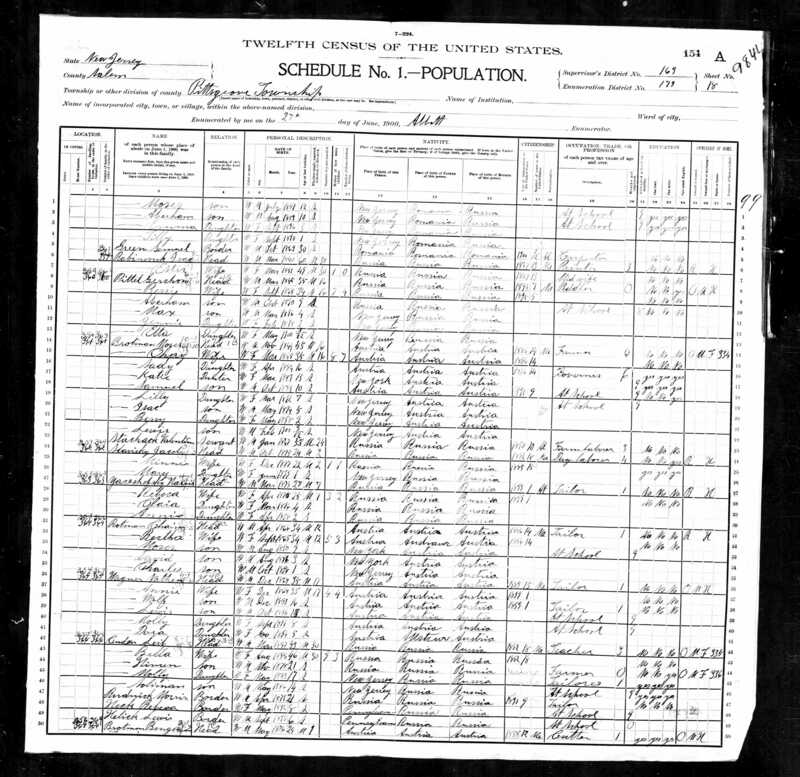 Why did he say he was born in Germany and emigrated in 1882? The birth dates also did not exactly line up, but I am used to the fact that no one ever reported their birthday consistently. When I looked at the handwritten application, I saw that the signature was definitely Max BrOtman, not BrAtman. My guess is that the clerk who filled out the card just could not decipher the handwriting. As for the wrong date, I have no guess except that Max was confused, wasn’t clear, or was trying to make it seem he’d been in the US for more than just 12 years. As for why Germany? I wish I knew. I know from Joseph Margoshes’ book that secularized, modern Jews were referred to as “German” in Galicia. Perhaps that’s why Max said Germany. Perhaps the clerk thought he was German because of his name, accent and use of Yiddish and suggested it to him and Max just agreed? I have no clue. 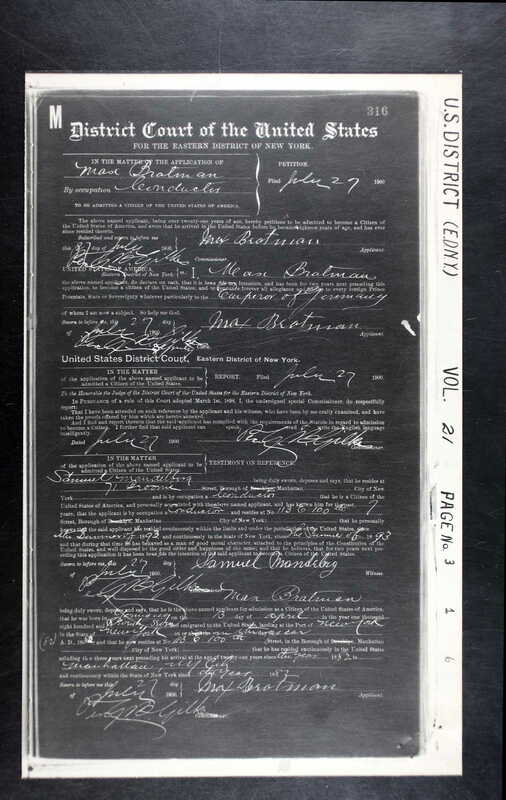 The census form was filled out just a month earlier than the naturalization form. 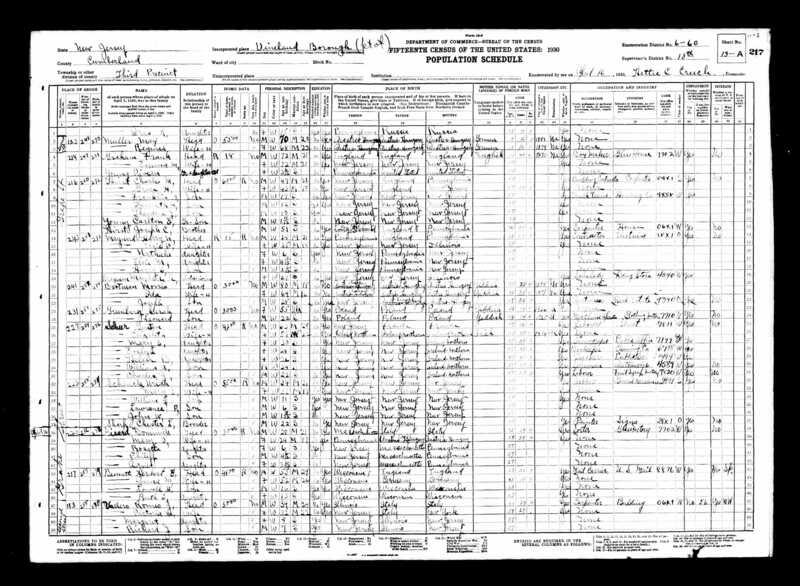 The census says his place of birth was Austria as does every other document listing Max’s place of birth. 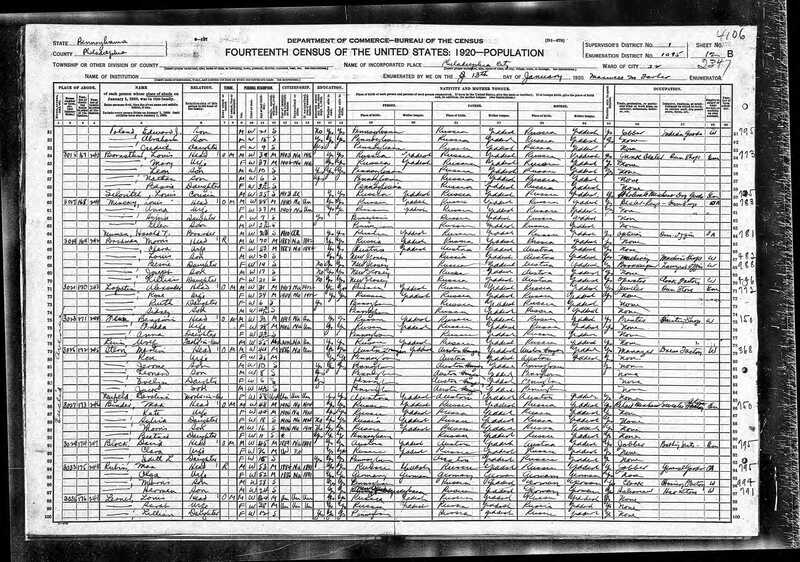 The census says he emigrated in 1888, which is also consistent with almost all the other forms. It would have made little sense for Max to have emigrated in 1882 when he was only four years old. So once again, we have evidence that forms are unreliable, that our ancestors were not too reliable, and that much must be left to conjecture and speculation. So where does that leave us in terms of identifying where our family lived in Galicia? Hanging on the thin thread of Hyman’s own unreliable documents, our best guess is Dzikow near Tarnobrzeg. I contacted Stanley Diamond who manages the archives of documents for JRI-Poland, and he sent me a list of all the records of all Brotmans and Brots from that area. 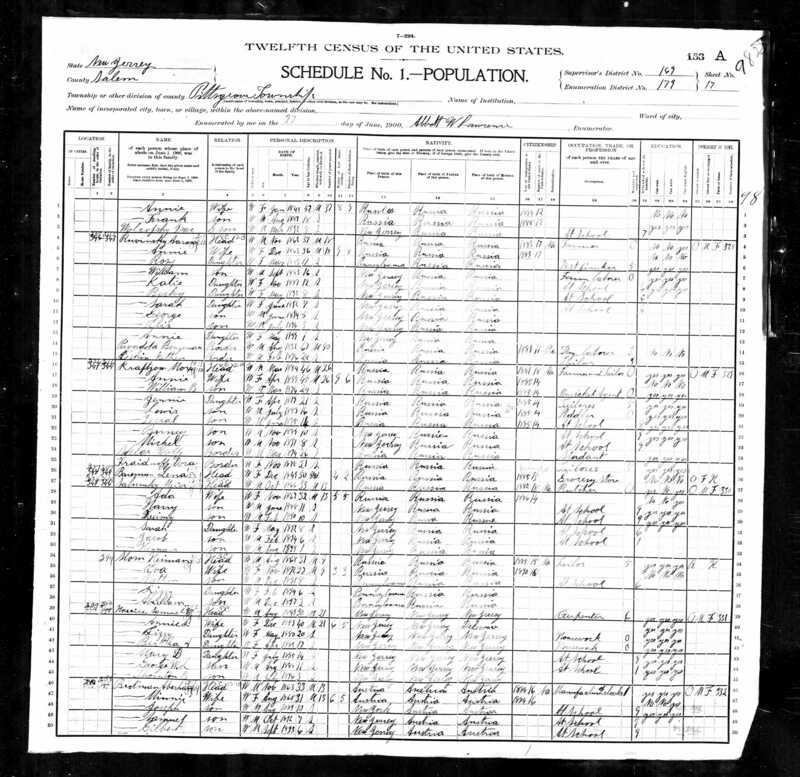 They are almost all of people born after 1900, and Stanley said that the records for that area are rather limited. 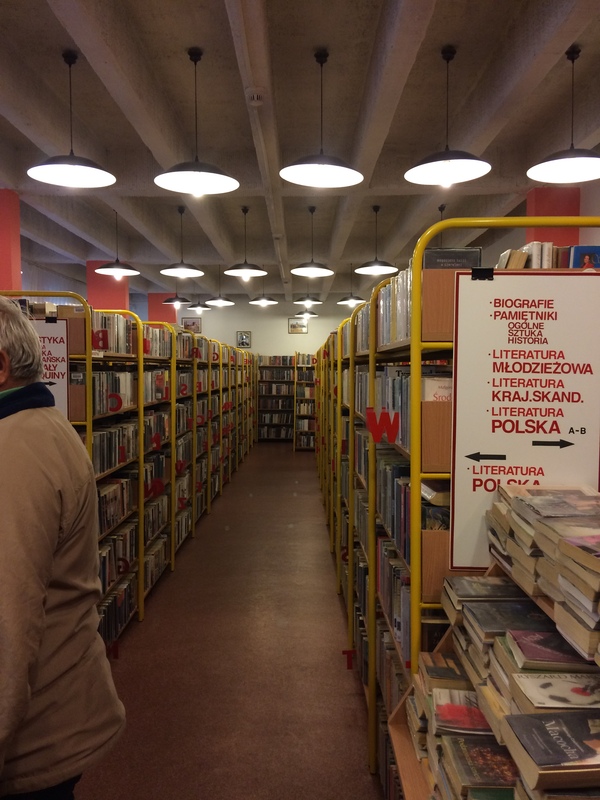 He said it would probably take a trip to archives in a few cities in Poland to learn if there is anything else and that that is probably a long shot. And thus, my cousins and friends, I think that for now I have hit a wall. 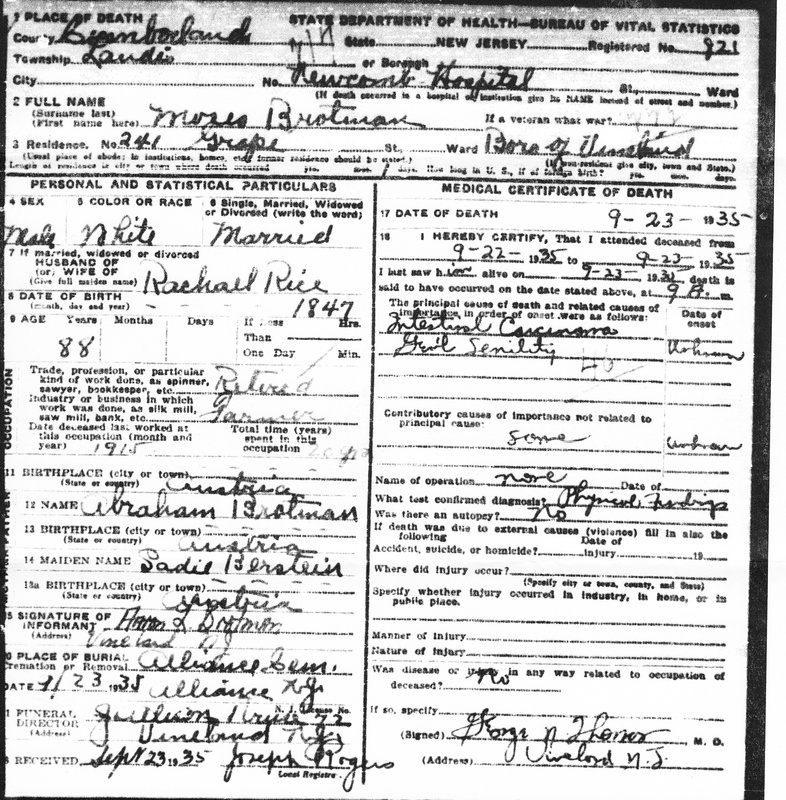 I am still waiting for Tillie’s death certificate and Hyman’s marriage certificate, but I am not putting any hope into finding out more information about their place of birth from those documents. 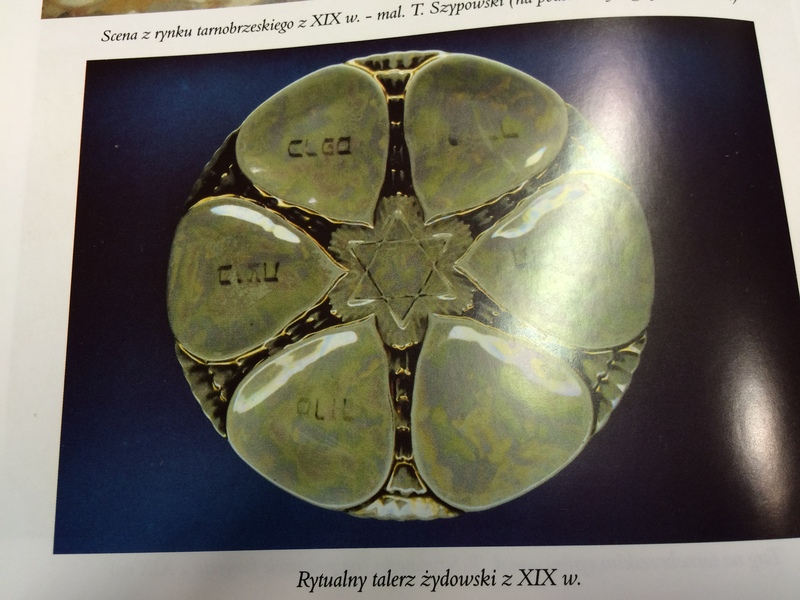 I am in touch with a researcher in Poland, and I am hoping to travel there perhaps in 2015, but for now I guess we have to accept that the best we can do is hang our hopes on Hyman’s references to Jeekief and Giga and assume that Dzikow near Tarnobrzeg is our ancestral home. Margoshes explains the political context for this by pointing out that in 1846 there had been a widespread revolt of the peasants against the wealthy Polish lords and landholders and that even forty years later, the politically powerful Polish aristocracy which controlled the government had not forgiven the peasants for the violence, deaths and damages caused by that uprising. Thus, in a dispute between a peasant and a Jew, the government would generally side with the Jew. Margoshes also attributed much of the peacefulness of the region to the Austro-Hungarian gendarmes who were responsible for keeping law and order in the Empire as part of the imperial army. 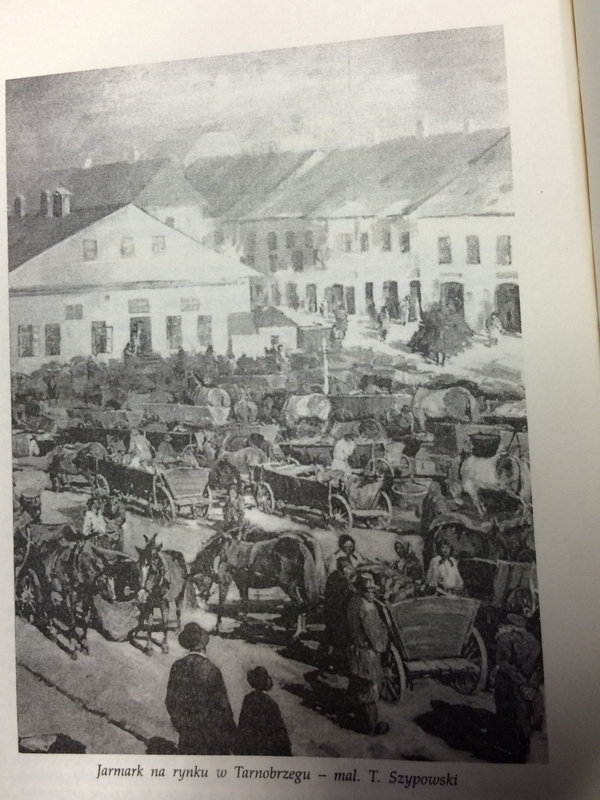 These soldiers lived in the area in barracks and frequently visited the estates to insure that all animals were registered and that everything was being managed according to the requirements of the Empire. 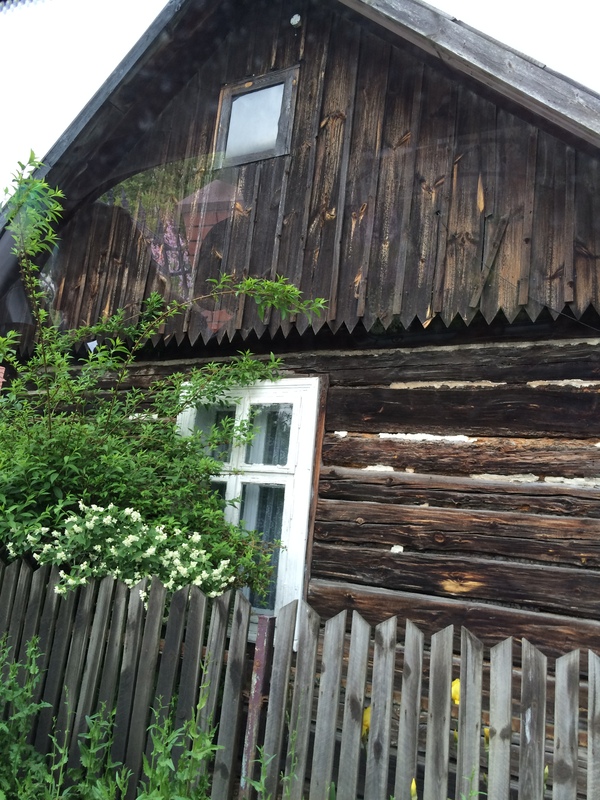 In one story about the workers at his father-in-law’s estate in Zgursk, moreoever, Margoshes also revealed that the relationships between the Polish peasants who worked on the estate and their Jewish employers were not always quite so amicable. There were at times hundreds of workers on the estate, and many of them boarded there. Margoshes himself admits that their living conditions were substandard: “everyone found a place to sleep in one of the three stables atop hay and straw and that was it. No pillows or sleepwear were provided and…a blanket used to cover horses served as a cover.” (p. 96) The estate did provide three meals a day that Margoshes described as generous. Margoshes’ mother-in-law and father-in-law were the task masters who oversaw all the work on the estate, and his father-in-law was known to be rather cold and strict. Margoshes described one time that his father-in-law lost his temper with some of the workers who in his view were not working hard enough and began beating them with a paddle. In response, these workers and a number of others went on strike and refused to return to the fields. It took an intervention from the mother of the father-in-law to persuade the workers to return to work the next day. Margoshes described this as if it were a one-time incident, and perhaps it was, but it does reveal that there was some abuse of the peasants by at least this powerful Jew, his own father-in-law. Thus, although Margoshes initially described the relationship between the gentile peasants and the Jews as peaceful and amicable, these incidents of theft and abusiveness suggest that there was in fact a great deal of resentment and anger among the peasants towards the Jews. Perhaps he was deluding himself when he wrote that it was a “true paradise” for Jews in this region during that time. According to Margoshes, the wealthy Jews also had good relationships with the wealthy Polish lords and landowners, called pritsim or porits in the singular. 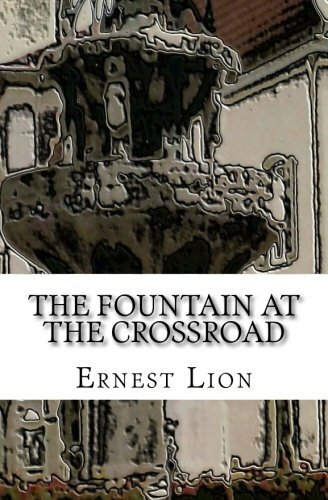 He described his relationship with a neighboring porits as “very friendly, although from a distance.” (p. 103) They would help each other out with favors, but were not social friends. Margoshes did not think that this relationship was unusual. He said that he “never heard of a case in the entire region of a porits who had negative relations with a Jew or where he insulted a Jew or harmed him in any way,” (p. 104) although he did then go on to mention one polits who refused to trade with Jews. There was also, according to Margoshes, peaceful co-existence between the Catholic priests and the Jewish population. Although he commented that “[p]riests, especially Catholic priests, cannot ever really be friends of the Jews” because “it is almost against [their]religion to love people of another faith,” (p.111), he reported that nevertheless for the most part there was little conflict between the priests and the Jewish estate holders. He described a church law that prohibited Catholics from working as servants in Jewish homes, but pointed out that it was rarely enforced since the peasants needed employment and often worked in Jewish homes. Margoshes even developed a friendship with one of the local priests, but he severed that relationship when the priest tried to persuade Margoshes to come and see his church—not to convert, but just to go inside the church. Obviously, this “friendship” was a superficial one based on necessity, and feelings of distrust and difference outweighed any sense of real connection. Margoshes made it clear that it would not have been acceptable for him, as a Jew, to be seen in a Catholic church. By the time I finished reading this section, I realized that Margoshes had had a very unrealistic view of the relationships between the Jews and non-Jews in Galicia during the late 19th century. First, his viewpoint is entirely based on the experiences of the wealthy Jewish estate-holders. The non-Jewish peasants may have seemed respectful and accepting of their Jewish employers, but beneath the surface there was likely a great deal of resentment and anger. 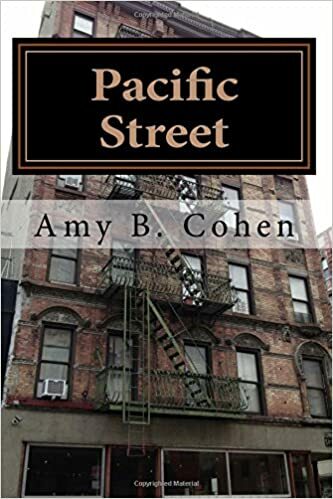 The priests and non-Jewish estate-holders also may have been willing to live peacefully side-by-side with the wealthy Jews, but there certainly was not a true acceptance or friendship in these relationships. The gendarmes may have been keeping the peace, but beneath the surface the Jews were still the outsiders who were not integrated into the gentile world. Moreover, Margoshes does not at all provide a picture of what life was like for the Jews who were not wealthy estate-holders. Were their relationships with the peasants, priests, and wealthy Polish landowners as “peaceful”? Or were they the targets of all the repressed resentment and anger that the gentiles felt towards the wealthy Jews? It occurred to me after reading these chapters that Margoshes was writing in 1936. He had no idea what was going to happen in Poland during the Holocaust. I wonder whether his naiveté about how the gentiles felt about the Jews was widespread in Poland during the 1930s and 1940s. If only they had been more realistic, perhaps more of them would have left sooner. Which brings me to another question: if things were so great in the 1880s and 1890s for wealthy Jews in Poland, why did Margoshes and so many others, including Joseph and Bessie, leave?